Jump down to Conference Papers, Presentations and Posters or learn more about SERC projects in our Portfolio. 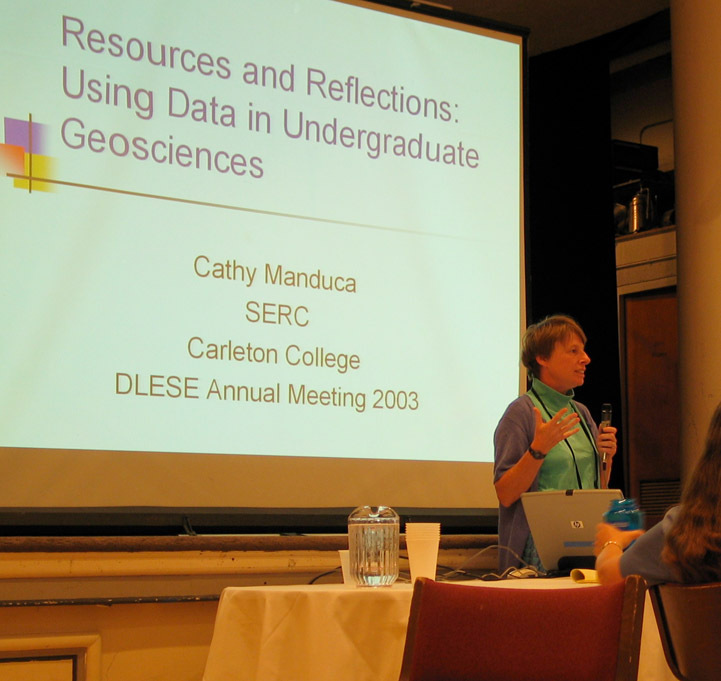 Cathy giving a talk at the 2003 DLESE Annual Meeting. Egger, A.E., Bruckner, M.Z., Birnbaum, S.J., Gilbert, L.A., 2019. Facilitating the Development of Effective Interdisciplinary Curricular Materials, Interdisciplinary Teaching About Earth and the Environment for a Sustainable Future, pp. 45-68. Published online Dec 14, 2018. Gosselin, D.C., Manduca, C.A., Bralower, T., Egger, A.E., 2019. Preparing Students to Address Societally Relevant Challenges in the Geosciences: The InTeGrate Approach, Interdisciplinary Teaching About Earth and the Environment for a Sustainable Future, pp. 2-23. Published online Dec 14, 2018. Orr, C.H., McDaris, J.R., 2019. Supporting Implementation of Program-Level Changes to Increase Learning About Earth,Interdisciplinary Teaching About Earth and the Environment for a Sustainable Future, pp. 69-89. Published online Dec 14, 2018. Iverson, E.R., Steer, D., Gilbert, L.A., Kastens, K.A., O'Connell, K., Manduca, C.A., 2019. Measuring Literacy, Attitudes, and Capacities to Solve Societal Problems, Interdisciplinary Teaching About Earth and the Environment for a Sustainable Future, pp. 91-119. Published online Dec 14, 2018. Steer, D., Iverson, E.R., Egger, A.E., Kastens, K.A., Manduca, C.A., McConnell, D., 2019. The InTeGrate Materials Development Rubric: A Framework and Process for Developing Curricular Materials that Meet Ambitious Goals, Interdisciplinary Teaching About Earth and the Environment for a Sustainable Future, pp. 25-43. Published online Dec 14, 2018. Eddy, P.L., Hao, Y., Markiewicz, C., & Iverson, E., 2018. Faculty change agents as adult learners: The power of situated learning, Community College Journal of Research and Practice. Published online Aug 10, 2018. Gold, A.U., Pendergast, P.M., Ormand, C.J., Budd, D.A., Stempien, J.A., Mueller, K.J. and Kravitz, K.A., 2018. Spatial Skills in Undergraduate Students -- Influence of gender, motivation, academic training, and childhood play, Geosphere, vol. 14, no. 2, pp. 668–683. Gold, Anne U., Philip M. Pendergast, Carol J. Ormand, David A. Budd, and Karl J. Mueller. Improving Spatial Thinking Skills among Undergraduate Geology Students through short online Training Exercises. International Journal of Science Education, DOI: 10.1080/09500693.2018.1525621. Goring, Simon James, Russell Graham, Shane Loeffler, Amy Myrbo, James S. Oliver III, Carol J. Ormand, and John W. Williams (2018). The Neotoma Paleoecology Database: A Research-Outreach Nexus (Elements of Paleontology). Cambridge: Cambridge University Press. doi:10.1017/9781108681582. Luo, W., Smith, T.J., Whalley, K., Darling, A., Ormand, C., Hung, W.C., Chiang, J.L., Pelletier, J. and Duffin, K., 2018. Earth surface modeling for education: How effective is it? Four semesters of classroom tests with WILSIM-GC, British Journal of Educational Technology. Published online August 20, 2018. Gagnier, K.M., Atit, K., Ormand, C.J., and Shipley, T.F., 2017. Comprehending Diagrams: Sketching to Support Spatial Reasoning, Topics in Cognitive Science, v.9, n. 4, pp. 883–901. Garnier, B., Chang, M., Ormand, C.J., Matlen, B., Tikoff, B., and Shipley, T.F., 2017. Promoting Sketching in Introductory Geoscience Courses: CogSketch Geoscience Worksheets, Topics in Cognitive Science, v. 9, n. 4, pp. 943–969. Kastens, K.A., and Manduca, C.A., 2017. Leveraging the Power of a Community of Practice to Improve Teaching and Learning about the Earth, Change: The Magazine of Higher Learning, Vol. 49, no. 6, pp. 14-22. Kastens, K.A., and Manduca, C.A., 2017. Using systems thinking in the Design, Implementation and Evaluation of Complex Educational Innovations, With Examples From the InTeGrate Project, Journal of Geoscience Education, Vol. 65, no. 3, pp. 219-230. Manduca, C.A., Iverson, E., Luxenberg, M., Macdonald, R.H., McConnell, D., Mogk, D., and Tewksbury, B., 2017. Improving undergraduate STEM education: The efficacy of discipline-based professional development, Science Advances, Vol. 3, no. 2. Manduca, C.A., 2017. Surveying the Landscape of Professional Development Research: Suggestions for New Perspectives in Design and Research, Journal of Geoscience Education, Vol. 65, no. 4, November 2017, pp. 416-422. McDaris, John R., Manduca, C.A., Iverson, E.R., and Orr, C.H., 2017. Looking in the Right Places: Minority-Serving Institutions as Sources of Diverse Earth Science Learners, Journal of Geoscience Education, Vol. 65, no. 4, November 2017, pp. 407-415. Ormand, Carol J., Thomas F. Shipley, Basil Tikoff, Barbara Dutrow, Laurel Goodwin, Thomas A. Hickson, Kinnari Atit, Kristin Michod Gagnier, and Ilyse Resnick (2017). The Spatial Thinking Workbook: A Research-Validated Spatial Skills Curriculum for Geology Majors. Journal of Geoscience Education, v. 65, n. 4, pp. 423-434. Teasdale, R., Viskupic, K., Bartley, J., McConnell, D., Manduca, C., Bruckner, M., Farthing D., and Iverson, E., 2017. A multidimensional assessment of reformed teaching practice in geoscience classrooms, Geosphere, Vol. 13, no. 2, pp. 608-627. White, T., 2017. Developing a New Transdisciplinary Curriculum in Critical Zone Science, In the Trenches, Vol. 7, no. 4, pp. 2-3. Condon, W., Iverson, E.R., Manduca, C.A., Rutz, C., and Willet, G., 2016. Faculty development and student learning: Assessing the connections, Indiana University Press, pp. 156. DiBartolo, P.M., Gregg-Jolly, L., Gross, D., Manduca, C.A., Iverson, E., Cooke III, D.B., Davis, G.K., Davidson, C., Hertz, P.E., Hibbard, L., Ireland, S.K., Mader, C., Pai, A., Raps, S., Siwicki, K., and Swartz, J.E., 2016. Principles and practices fostering inclusive excellence: lessons from the Howard Hughes Medical Institute's capstone institutions, Broadening Participation in the Life Sciences, Vol. 15, no. 3, pp. 44. Gagnier, K.M., Shipley, T.F., Tikoff, B., Ormand, C.J., Atit, K., Resnick, I., and Garnier, B., 2016. Training spatial skills in geosciences: a review of tests and tools, AAPG Memoir 111: 3-D Structural Interpretation, Earth, Mind, and Machine, pp. 7-23. Kastens, K.A., and Manduca, C.A., 2016. Using systems thinking to design, implement and evaluate the InTeGrate project (Acrobat (PDF) 857kB Apr25 16), InTeGrate White Paper. Krantz, R.W., Ormand, C.J., and Freeman, B., 2016. AAPG Memoir 111: 3-D Structural Interpretation: Earth, Mind, and Machine. Krantz, R.W., Ormand, C.J., and Freeman, B., 2016. Earth, Mind, and Machine: a Summary of the 2013 AAPG Hedberg Conference on 3D Structural Interpretation. Luo, W., Pelletier, J., Duffin, K., Ormand, C.J., Hung, W., Shernoff, D.J., Zhai, X., Iverson, E., Whalley, K., Gallaher, C., and Furness, W., 2016. Advantages of computer simulation in enhancing students' learning about landform evolution: A case study using the Grand Canyon, Journal of Geoscience Education , Vol. 64, no. 1, pp. 60-73. Manduca, C.A., Macdonald, R.H., and Goodell, L., 2016. Learning about teaching: Geoscience educators share insights, Eos, Vol. 97, April 1, 2016, doi:10.1029/2016EO049397. Manduca, C.A., Macdonald, R.H., and Goodell, L., 2016. First Annual Earth Educators' Rendezvous, In the Trenches, Vol. 5, no. 4, pp. 16-17. Mogk, D., Geissman, J., and Bruckner, M., 2016. Teaching Geoethics Across the Geoscience Curriculum: Why, When, What, How, and Where? Scientific Integrity and Ethics in the Geosciences? A Handbook and History, American Geophysical Union, pp. 200. Orr, C.H., Newman, A., and Manduca, C.A., 2016. InTeGrate: Interdisciplinary Teaching of Geoscience for a Sustainable Future, In the Trenches, Vol. 6, no. 3, pp. 3-4. Petcovic, H.L., Ormand, C.J., and Krantz, R.W., 2016. Earth, mind, and paper: Field sketches as expert representations of the hat creek fault zone, AAPG Memoir 111: 3-D Structural Interpretation: Earth, Mind, and Machine, pp. 173-189. Steer, D., Iverson, E., Egger, A., Kastens, K., Manduca, C.A., and McConnell, D. In review. Multi-instituitonal college curriculum development using peer-to-peer auditing and coaching system: Lessons from the InTeGrate project, Curriculum Journal. Gross, D., Iverson, E., Willett, G., and Manduca, C., 2015. Broadening Access to Science With Support for the Whole Student in a Residential Liberal Arts College Environment, Journal of College Science Teaching , Vol. 44, no. 8, pp. 99-107. Newcombe, N., Weisberg, S.M., Atit, K., Jacovina, M.E., Ormand, C.J., and Shipley, T.F., 2015. The Lay of the Land: Sensing and Representing Topography, The Baltic International Yearbook of Cognition, Logic, and Communication: Perspectives on Spatial Cognition, Vol. 1, pp. 1-57. O'Connell, K., Bruckner, M.Z., Manduca, C.A., and Gosselin, D.C., 2015 (online publication date). Supporting Interdisciplinary Teaching about the Earth with the InTeGrate Website, Journal of Environmental Studies and Sciences, Vol. 6, pp. 354. Doser, D.I., Manduca, C., and Rhodes, D., 2014. Recruiting and Supporting Diverse Geoscience and Environmental Science Students, Eos Transactions American Geophysical Union, Vol. 95, pp. 289. Dancy, M., Hora, M., Ferrare, J., Iverson, E., Lattuca, L., and Turns, J., 2014. Describing and Measuring Undergraduate STEM Teaching Practice: A Report from a National Meeting on the Measurement of Undergraduate Science, Technology, Engineering and Mathematics (STEM) Teaching, American Association for the Advancement of Science. Jee, B. D., Gentner, D., Uttal, D. H., Sageman, B., Forbus, K., Manduca, C., Ormand, C. J., Shipley, T., and Tikoff, B., 2014. Drawing on experience: How domain knowledge is reflected in sketches of scientific structures and processes, Research in Science Education, Vol. 44, pp. 859. Kirk, K., Gold, A., Ledley, T.S., Sullivan, S.B., Manduca, C., Mogk, D., and Wiese, K., 2014. Undergraduate Climate Education: Motivations, Strategies, Successes, and Support, Journal of Geoscience Education, Vol. 62, pp. 538-549. Krantz, Robert, Carol Ormand, and Brett Freeman (2014). Summary of the 2013 Hedberg Conference on 3D Structural Geologic Interpretation: Earth, Mind, and Machine. Hedberg Tackles 3D Interpretation: Geologists Get a Closer Look at Complexity: AAPG Explorer, Feb. 2014, pp. 30-34. Ormand, Carol J., Cathryn A. Manduca, Thomas F. Shipley, Basil Tikoff, Cara L. Harwood, Kinnari Atit, and Alexander P. Boone (2014). Evaluating Geoscience Students' Spatial Thinking Skills in a Multi-Institutional Classroom Study, Journal of Geoscience Education, Vol. 62, n. 1, pp. 146-154. JGE Paper of the Year. Willett, G., Iverson, E., Rutz, C., and Manduca, C. 2014. Measures matter: Evidence of faculty development effects on faculty and student learning, Assessing Writing, Vol. 20, pp. 19-36. Bruckner, M., 2013. Engaging Students in Learning: Examples from the SERC Sites, In the Trenches, Vol. 3, no. 3, pp. 6-7. Gosselin, D.C., Manduca, C., Oches, E., MacGregor, J., and Kirk, K., 2013. Curricular Materials Integrate Geosciences into the Teaching of Sustainability, In the Trenches, Vol. 3, no. 4, pp. 10-11. Gosselin, D.C., Manduca, C., Bralower, T., and Mogk, D., 2013. Transforming the Teaching of Geoscience and Sustainability, Eos Trans AGU Publications, Vol. 94, no. 25, pp. 221-222. Manduca, C.A., Tikoff, B., and Hotchkiss, S., 2013. The Evolving Nature of Collaboration in the Geological Sciences. Rethinking the Fabric of Geology, Geological Society of America Special Paper, Vol. 502, pp. 153-164. National Research Council., 2013. Preparing the Next Generation of Earth Scientists: An Examination of Federal Education and Training Programs, The National Academies Press. Shipley, T.F., Tikoff, B., Ormand, C.J., and Manduca C.A., 2013. Structural Geology Practice and Learning, from the Perspective of Cognitive Science, Journal of Structural Geology, Vol. 54, pp. 72-84. Tewksbury, B., Manduca, C.A., Mogk, D.W., and Macdonald, R.H., 2013. Geoscience Education for the Anthropocene, The Impact of the Geological Sciences on Society: Geological Society of America Special Paper, Vol. 501, pp. 189-201. Banta, L.M., Crespi, E.J., Nehm, R.H., Schwarz, J.A., Singer, S., Manduca, C.A., Bush, E.C., Collins, E., Constance, C.M., Dean, D., Esteban, D., Fox, S., McDaris, J., Paul, C.A., Quinan, G., Raley-Susman, K.M., Smith, M.L., Wallace, C.S., Withers, G.S., and Caporale, L., 2012. Integrating Genomics Research throughout the Undergraduate Curriculum: A collection of inquiry-based genomics lab modules, CBE Life Science Education, Vol. 11, pp. 1–5. Kastens, K.A., and Manduca, C.A., 2012. Fostering Knowledge Integration in Geoscience Education, Earth and Mind II: A Synthesis of Research on Thinking and Learning in the Geosciences, Geological Society of America Special Paper, Vol. 486, pp. 183-206. Narum, J., and Manduca, C., 2012. Workshops and Networks in Brainbridge, Leadership in Science and Technology, A Reference Handbook, p. 443-451. Manduca, C.A., and Kastens, K.A., 2012. Geoscience and geoscientists: Uniquely equipped to study Earth, Earth and Mind II: A Synthesis of Research on Thinking and Learning in the Geosciences, Geological Society of America Special Paper, Vol. 486, pp. 1–12. Ormand, C., 2012. Learning to Think Spatially, In the Trenches, Vol. 2, no. 2, pp. 10-11. Rutz, C., Condon, W., Manduca, C., and Willett, G., 2012. Faculty Professional Development and Student Learning: What is the Relationship?, Change: The Magazine of Higher Learning, Vol. 44, no. 3, pp. 40-47. Manduca, C.A., 2011. Improving undergraduate geoscience education - A Community Endeavor, GSA Today, Vol. 21, no. 9, pp. 12-14. Jee, B.D., Uttal, D., Gentner, D., Manduca, C., Shipley, T., Sageman, B., Ormand, C.J., and Tikoff, B., 2010. Commentary: Analogical thinking in geoscience education, Journal of Geoscience Education, Vol. 58, no. 1, pp. 2-13. Manduca, C.A., Mogk, D.W., Tewksbury, B., Macdonald, R.H., Fox, S.P., Iverson, E.R., Kirk, K., McDaris, J., Ormand, C., and Bruckner, M., 2010. SPORE: Science Prize for Online Resources in Education: On the Cutting Edge: Teaching Help For Geoscience Faculty, Science, Vol. 327 no. 5969, pp. 1095-1096. Williams, M.L., Mogk, D.W., and McDaris, J., 2010. Research and Teaching about the Deep Earth, Eos, Vol. 91, no. 32. Kastens, K., Manduca, C.A., Cervato, C., Frodeman, R., Goodwin, C., Lieben, L.S., Mogk, D.W., Spangler, T.C., Stillings, N.A., and Titus, S., 2009. How Geoscientists Think and Learn, Eos Trans, AGU, Vol. 90, no. 31, pp. 265. Wenner, J.M., Baer, E.M., Manduca, C.A., Macdonald, R.H., Patterson, S., and Savina, M., 2009. The Case for Infusing Quantitative Literacy into Introductory Geoscience Courses, Numeracy, Advancing Education in Quantitative Literacy, Vol. 2, no. 1. Bralower, T., Manduca, C.A., and Feiss, P.G., 2008. Preparing a New Generation of Citizens and Scientists to face Earth's Future, Liberal Education, Vol. 94, no. 2. Manduca, C.A., 2008. Working with the Discipline - Developing a Supportive Environment for Education, In Evidence on Promising Practices in Undergraduate Science, Technology, Engineering, and Mathematics (STEM), National Academy of Sciences. Manduca, C.A., Baer, E., Hancock, G., Macdonald, R.H., Patterson, S., Savina, M., and Wenner, J., 2008. Making Undergraduate Geoscience Quantitative, EOS, Vol. 89, no. 16, pp. 149-150. Manduca, C., and Johnston, J., 2008. Engaging Faculty in Discussion of the Affective Domain: A Practical Strategy, The National Teaching & Learning Forum, Vol. 17, no. 3. Manduca, C., Macdonald, H., and Feiss, G., 2008. Education: Preparing Students for Geosciences of the Future, Geotimes, Vol. 53, no. 4, pp. 59. McMartin, F., Iverson, E., Wolf, A., Morrill, J., Morgan, G., and Manduca, C., 2008. The Use of Online Digital Resources and Educational Digital Libraries in Education, International Journal on Digital Libraries, Vol. 9, no. 1. Richardson, R.M., and Ormand, C.J., 2008. Survey of Geoscience Departments Finds Shared Goals and Challenges (Acrobat (PDF) 415kB Oct1 08), Eos, Vol. 89, no. 27, pp. 242-243. Abstract available on the AGU site. Manduca, C.A., 2007. Improving Instruction in Mineralogy, Petrology, and Geochemistry - Lessons from Research on Learning, Elements, Vol. 3, no. 2, pp. 95-100. Manduca, C.A., 2007. On the Cutting Edge of Teaching About Early Earth, Geotimes, Vol. 52, no. 7, pp. 44-45. Manduca, C. A., and Cifuentes, I., 2007. Developing Earth and Space Scientists for the Future,Eos Trans. AGU , Vol. 88, no. 38, pp. 373. Manduca, C., and Mason, B., 2007. Pedagogy in Action: On-line Resources for Physics Faculty and Teachers, Forum on Education of the American Physical Society, Fall 2007 Newsletter. Manduca, C., Petcovic, H., and Linneman, S., 2007. Geoscience Faculty Discuss Courses for Future Earth Science Teachers, Eos Trans AGU, Vol. 88, no. 42, pp. 428. Bierman, P., Massey, C., and Manduca, C., 2006. Reconsidering the Textbook. Eos Trans AGU, Vol. 87, no. 31, pp. 306. Iverson, E., Fox, S., and Manduca, C., 2006. SERC Pop Up Survey Results (Microsoft Word 197kB Apr28 06). Manduca, C.A., and Carpenter, J.R., 2006. Teaching in the Field, Special issue of the Journal of Geoscience Education, Vol. 54, no. 2. Manduca, C.A., Fox, S., and Iverson, E.R., 2006. Digital Library as Network and Community Center, D-Lib, Vol. 12, no.12. Manduca, C.A., Macdonald, H., Mogk, D., and Tewksbury, B., 2006. On the Cutting Edge: Evolving Themes, Enduring Impact (Acrobat (PDF) 335kB Apr25 06), Science Education Resource Center. Manduca, C.A., and Mogk, D.W., 2006. Earth and Mind: How Geologists Think and Learn about the Earth, The Geological Society of America. McMartin, F., Iverson, E., Manduca, C., Wolf, A., and Morgan, G., 2006. Factors Motivating Use of Digital Libraries Proceedings of the 6th ACM/IEEE-CS joint conference on Digital libraries, ACM Press. Fox, S., Manduca, C.A., and Iverson, E., 2005. Building Educational Portals atop Digital Libraries, D-Lib, Vol. 11, no. 1. Hancock, G., and Manduca, C.A., 2005. Developing Quantitative Skills Activities for Geoscience Students, EOS, Vol. 86, no. 39, pp. 355. Iverson, E., Manduca, C., and Fox, S., 2005. SERC Results of an Email Poll (Microsoft Word 36kB May1 06). Macdonald, R.H., Manduca, C.A., Mogk, D.W., and Tewksbury, B.J., 2005. Teaching Methods in Undergraduate Geoscience Courses: Results of the 2004 On the Cutting Edge Survey of US Faculty, Journal of Geoscience Education , Vol. 53, no. 3, pp. 237. Macdonald, R.H., Manduca, C.A., Mogk, D.W., and Tewksbury, B.J., 2004. On the Cutting Edge: Improving Learning by Enhancing Teaching in the Geosciences (Acrobat (PDF) 87kB Apr11 14), Invention and Impact: Building Excellence in Undergraduate Science, Technology, Engineering, and Mathematics (STEM) Education, Vol. 381. Manduca, C.A., Macdonald, H., Mogk, D., and Tewksbury, B., 2004. On the Cutting Edge: Leadership development in the Geosciences, Project Kaleidoscope: What works, what matters, what lasts, Vol. 4. Manduca, C.A., Mogk, D.W., and Stillings, N., 2004. Bringing Research on Learning to the Geosciences, Science Education Resource Center, Vol. 32. Manduca, C.A., and Mogk, D.W., 2003. Using Data in Undergraduate Classrooms, Science Education Resource Center, Carleton College, Vol. 36. Manduca, C.A., McMartin, F., and Mogk, D., 2001. Pathways to progress: Vision and Plans for Developing the NSDL: Report to the National Science Foundation . Manduca, C.A., and Mogk, D.W., 2000. DLESE (Digital Library for Earth System Education): A Community Plan. University of Oklahoma, pp. 46. Eddy, P.L., Hao, Y.H., Bragg, D., and Iverson, E., April, 2018. The influence of mental maps on engagement in transformative change efforts, Peer reviewed paper at the Annual Conference of the Council for the Study of Community Colleges, (Dallas, TX). Eddy, P.L., Iverson, E., Hao, Y., and Markiewicz, C., November 2017. Change agents as adult learners: The power of situated learning. Peer reviewed research paper at the Annual meeting of the Association for the Study of Higher Education (Houston, TX). Eddy, P.L., Hao, Y., Iverson, E., and Bragg, D., April 2017. Changing teaching practices to support student success: The role of communities of practice. Peer reviewed research paper at the Annual Conference of the Council for the Study of Community Colleges (Fort Worth, TX). John showing a SERC website to an attendee at the 2004 DLESE Annual Meeting. Hodder, J., Macdonald, R.H., Baer, E.M.D., Beane, R., Bragg, D., Emerson, N., Iverson, E.R., McDaris, J.R., O'Connell, K., Ormand, C. (2019). Engaging Two-year Geoscience College Faculty to Promote Diversity, Equity, and Inclusion: The SAGE 2YC Project. Presented at ASLO 2019 Aquatic Sciences meeting. Orr, Cailin H., Sean P. Fox, and Carol J. Ormand (2019). Teach the Earth: Portal for Geoscience Education Resources: Geoscience Alliance meeting (Phoenix, AZ). Awalt, M., Burleson, D., Kempler, L., Manduca, C., Fox, S., December 2018. A Peer-Contributed and Peer-Reviewed Collection of MatLab Based Teaching Activities for Educators in the Geoscience and Allied Fields AGU Fall Meeting (Washington, D.C.). Bruckner, M., Manduca, C., Fox, S., Iverson, E., O'Connell, K., Sheriff, K., Egger, A., November 2018. Engaging Students Understanding Earth in the Context of Societal Issues through the InTeGrate Teaching Materials GSA Annual Meeting (Indianapolis, IN). Bruckner, M., Manduca, C.A., McDaris, J., and Orr, C.H., July 2018. Supporting Interdisciplinary Teaching about the Earth for a Sustainable Future through the InTeGrate Project, Earth Educators' Rendezvous (Lawrence, KS). Eddy, P., Iverson, E., and Hao, Y. April, 2018. Fostering communities of practice among community college STEM faculty: Connecting the dots, Roundtable session at the 2018 Annual Meeting of the American Educational Research Association (New York, NY). Haveles, A., Awalt, M., MacDonald, R. H., Beane, R., Doser, D., Ebanks, S., Riihimaki, C., Villalobos, J., Weissmann, G. and Manduca, C., November 2018. Seeding a System of Broadening Participation in the Geosciences through Traveling Workshops GSA Annual Meeting (Indianapolis, IN). Iverson, E., Macdonald R. H., Baer, E., Bragg, D., Eddy, P., Emerson, N., Hodder, J., McDaris, J., O'Connell, K., Ormand, C., November 2018. Building a Community of Practice among Geoscience Two-Year College Faculty: A Framework to Support Individual Learning and Collective Change GSA Annual Meeting (Indianapolis, IN). Kempler, L., Manduca, C., Awalt, M., December 2018. Tools and Resources for Educators: Teaching Quantitative Thinking in Geoscience with MatLab AGU Fall Meeting (Washington, D.C.). Awalt, M., Kempler, L., and Ormand, C., July 2018. Using MATLAB to Teach Computational and Quantitative Thinking Skills in STEM Courses, Earth Educators' Rendezvous (Lawrence, KS). Ledley, T.S., Gold, A.U., Niepold, F., Taylor, J., Kirk, K., Bruckner, M. and Fox, S., 2018. Invited: Using the CLEAN Collection to Build Three-Dimensional Lessons to Teach the Climate System, Goldschmidt Abstracts (Boston, MA). Macdonald, R. Heather, Eric M. D. Baer, Rachel J. Beane, Debra Bragg, Norlene R. Emerson, Jan Hodder, Ellen Iverson, John R. McDaris, Kristin O'Connell, and Carol J. Ormand (2018). Promoting Diversity, Equity, and Inclusion: Engaging SAGE 2YC Faculty to Transform Geoscience in Two-Year Colleges: Geological Society of America annual meeting (Indianapolis, IN). See abstract. Macdonald, R. Heather, Eric M. D. Baer, Debra Bragg, Pamela Eddy, Norlene R. Emerson, Jan Hodder, Ellen Iverson, John R. McDaris, Kristin O'Connell, and Carol J. Ormand (2018). Catalyzing Inclusive Education Practices in Two-Year College Geoscience Programs and Departments: SAGE 2YC and Faculty Change Agents: American Geophysical Union annual fall meeting (Washington, DC). Manduca, C., Blockstein, D., Bralower, T., Davis, F., Doser, D., Egger, A., Fox, S., Gilbert, L., Gosselin, D., Gragg III, R. and Iverson, E., April 2018. InTeGrate project: Interdisciplinary Teaching about the Earth for a Sustainable Future, European Geosciences Union General Assembly (Vienna, Austria). Manduca, C., Gilbert, L., Gragg, R.S., Iverson E. A. R., MacDonald, H., McConnell, D., Nagy-Shadman, E.A., Steer, D., December 2018. Community-Based Research Teams: Examples from On The Cutting Edge and InTeGrate Projects AGU Fall Meeting (Washington D.C.). McDaris, J., Ormand, C., Baer, E.M., Hodder, J., Macdonald, R. H., and Emerson N., July 2018. SAGE 2YC: Sustaining Faculty Learning. Poster presented at the 2018 Earth Educator's Rendezvous (Lawrence, KS). McDaris, J., Manduca, C., Iverson, E., Orr, C.H., December 2018. Teach The Earth: Linking Research and Practice to Attract, Support, and Prepare Diverse Students for Geoscience Careers, AGU Fall Meeting (Washington D.C.). Mogk D, Hochella M, Ranville J and Bruckner M., 2018. Resources for Teaching Nanoscience Across the Geoscience Curriculum, Goldschmidt Abstracts (Boston, MA). O'Connell, Kristin, Iverson, Ellen, Sheriff, Kathryn, 2018. Measuring the Reach and Influence of InTeGrate Materials on Faculty Teaching Practices, Poster presented at 2018 Earth Educators' Rendezvous (Lawrence, KS). Ormand, Carol J., R. Heather Macdonald, Eric M. D. Baer, Rachel J. Beane, Jan Hodder, John R. McDaris, and Kristin O'Connell (2018). Diversity, Equity, and Inclusion: SAGE 2YC Resources for the Geoscience Community (Acrobat (PDF) 6.8MB Nov9 18): Geological Society of America annual meeting (Indianapolis, IN). See abstract. Orr, C.H., H. Scherer, C. Forbes, M. Bruckner. 2018. Teaching About Food, Water and Energy in the Context of Sustainability: Opportunities and Connections with the InTeGrate STEP Center. Poster. American Geophysical Union, Fall Meeting, Washington D.C.
Orr, C.H., Dolan, E.L., McDaris, J.R., Haveles, A.W. (2018). CUREnet : Faculty Network for Designing, Teaching, and Evaluating CUREs. Geological Society of America Abstracts with Programs. Vol. 50, No. 6, ISSN 0016-7592. Orr, C.H. and McDaris, J., July 2018. Working with and across networks to support institutional change. Earth Educators' Rendezvous (Lawrence, KS). Orr, C.H., J.R. McDaris, C.A. Manduca. 2018. Lessons from the InTeGrate (Interdisciplinary Teaching about Earth for a Sustainable Future) STEP Center on Program Scale Change: Synthesizing Real-World Experience. (Poster). Ecological Society of America. Annual Meeting. New Orleans, LA. Teasdale, R., Ryker, K., Viskupic, K., Manduca, C., November 2018. Active Learning Strategies in Introductory Geosciences Courses: Successes and Challenges with Online Course Development GSA Annual Meeting (Indianapolis, IN). Soule, D., T.J. Crone, C. O'Reilly, and C.H. Orr. 2018. Environmental Data-Driven Inquiry and Exploration (Project EDDIE): Successes and Challenges Using Large Online Datasets to Build Quantitative Reasoning. Poster. American Geophysical Union, Fall Meeting, Washington D.C.
Viskupic, K., Ryker, K., Teasdale, R., Manduca, C., November 2018. Evidence that Teaching with InTeGrate Results in Active Learning Practices GSA Annual Meeting (Indianapolis, IN). Awad, A., Gilbert, L., Iverson, E., Manduca, C., and Steer, D., December 2017. Using InTeGrate Materials to Develop Interdisciplinary Thinking for a Sustainable Future, AGU Fall Meeting (New Orleans, LA). Beane, R., Macdonald, R., Allen-King, R., Hill, T., Ormand, C., Penniston-Dorland, S., Tewksbury, B., and Yuretich, R., 2017. Workshop for Early Career Geoscience Faculty: Teaching, Research, and Managing One's Career, GSA Annual Meeting (Seattle, WA). Baer, E., Blodgett, R., Emerson, N., Hodder, J., McDaris, J., Macdonald, R., and Ormand, C., 2017. Adapting and Extending the On the Cutting Edge Model of Professional Development to Bring Workshops to Two-Year College Faculty, GSA Annual Meeting (Seattle, WA). Bruckner, M., Fox, S., Hanselman, J., Manduca, C., McConnell, D., McDaris, J., and Orr, C.H., 2017. Using Instructor Stories to Demonstrate the Adaptability of the Integrate Interdisciplinary Sustainability Curricula, GSA Annual Meeting (Seattle, WA). Eddy, P.L., Hao, Y., Markiewicz, C., Iverson, E., and Bragg, D., February 2017. Building good teaching practices in STEM: Exemplar portraits. Peer reviewed poster at the Conference on Higher Education Pedagogy (Blacksburg, VA). Egger, A., Fox, S., McDaris, J., and Gilbert, L., 2017 Facilitating Three-Dimensional Learning With Adaptable, Searchable, NGSS-Aligned Curricular Materials from Integrate GSA Annual Meeting (Seattle, WA). Gilbert, L., Iverson, E., Kastens, K., Awad, A., McCauley, E., Caulkins, J., Steer, D., Czajka, C., McConnell, D., and Manduca, C., 2017. Explicit Focus on Systems Thinking in InTeGrate Materials Yields Improved Student Performance, GSA Annual Meeting (Seattle, WA). Gold, A., Sullivan, S., Manning, C., Ledley, T., Youngman, E., Taylor, J., Niepold, F., Kirk, K., Lockwood, J., Bruckner, M., and Fox., S., December 2017. Using the CLEAN Educational Resource Collection for Building Three-Dimensional Lessons to Teach the Climate System, AGU Fall Meeting (New Orleans, LA). Hao, Y., Eddy, P.L., Bragg, D., and Iverson, E., April 2017. Becoming change agents: Geoscience faculty at two-year institutions. Peer reviewed research paper at the Annual Conference of the Council for the Study of Community Colleges (Fort Worth, TX). Iverson, E., 2017. On the Cutting Edge Early Career Faculty Workshops: Enduring Influence on Improved Teaching in Departments, GSA Annual Meeting (Seattle, WA). Iverson, E., Ormand, C., McDaris, J., and Macdonald, H., 2017 Supporting and Advancing Geoscience Education in Two-Year Colleges (SAGE 2YC): Building a Foundation for Change through a Network of Regional Communities of Practice, Earth Educators' Rendezvous (Albuquerque, NM). Kastens, K., and Orr, C.H., July 2017. Using Design Patterns as a Strategy for Capturing Generalizable Knowledge from Educational Interventions, Earth Educators' Rendezvous (Albuquerque, NM). Kastens, K., and Manduca, C., 2017 Why is the Geoscience Education Community of Practice So Effective?, GSA Annual Meeting (Seattle, WA). Macdonald, H., Manduca, C., Beane, R., Doser, D., Ebanks, S., Hodder, J., McDaris, J., and Ormand, C., December 2017. Diversifying Geoscience by Preparing Faculty as Workshop Leaders to Promote Inclusive Teaching and Inclusive Geoscience Departments, AGU Fall Meeting (New Orleans, LA). Macdonald, R., Baer, E., Bragg, D., Eddy, P., Emerson, N., Hao, Y., Hodder, J., Iverson, E., McDaris, J., and Ormand, C., 2017 Student Success in Geoscience: A SAGE 2YC Perspective, GSA Annual Meeting (Seattle, WA). Manduca, C., 2017. Transforming Earth Education - A Look Backward and Forward, Earth Educators' Rendezvous (Albuquerque, NM). Manduca, C., December 14, 2017. InTeGrate: Interdisciplinary Teaching about the Earth for a Sustainable Future, AGU Fall Meeting (New Orleans, LA). Manduca, C., Nagle, B., Taber, J., McGill, S., Ellins, K., Harris, G., Charlevoix, D., Pandya, R., Davis, F., Benthien, M., and Neely, N., 2017. EarthConnections, Earth Educators' Rendezvous (Albuquerque, NM). Manduca, C., Macdonald, R., Mogk, D., Tewksbury, B., Beane, R., McConnell, D., Wiese, K., and Wysession, M., 2017 On the Cutting Edge: Enduring Learning Opportunities for Geoscience Faculty, GSA Annual Meeting (Seattle, WA). Manduca, C., Orr, C.H., Iverson, E., Davis, F., Gragg, R.S., Kastens, K., and Steer, D., February 6 2017. Report to NSF on Progress and Findings of the InTeGrate STEP Center (Acrobat (PDF) 1.4MB Feb8 17). Manduca, C., December 2017. EarthConnections: Integrating Community Science and Geoscience Education Pathways for More Resilient Communities, AGU Fall Meeting (New Orleans, LA). Manduca, C., Benthien, M., Charlevoix, D., Davis, F., Ellins, K., Haddock, D., Iverson, C., McGill, S., Morris, A., Nagle, B., Neely, N., Pandya, R., Peterman, K., and Taber, J. Supporting Local Pathways Linking Geoscience Learning to Community Engagement: The EARTHCONNECTIONS Alliance, GSA Annual Meeting (Seattle, WA). Manduca, C., 2017. SERC - A presentation for CariUSA STEM Workgroup. (New Kingston, Jamaica). McDaris, J., Bralower, T., Anbar, A., and Leinbach, A., 2017. Best Practices in Teaching Online: Faculty-Sourced Guidance from Integrate, GSA Annual Meeting (Seattle, W,A). McDaris, J., Baer, E., Macdonald, R., Ormand, C., Hodder, J., and Emerson, N., 2017 The SAGE 2YC Website: Updated Content to Support 2YC Faculty as Agents of Change, GSA Annual Meeting (Seattle, WA). McDaris, J. and Orr, C.H., July 17 2017. Lessons from the InTeGrate Implementation Teams: Synthesizing Real-World Experience, Earth Educators' Rendezvous (Albuquerque, NM). McFadden, R., Viskupic, K., Manduca, C., Egger, A., and Iverson, E., 2017 Understanding the Use of Quantitative Skills and Data Analysis in the Teaching of Undergraduate Geosciences, GSA Annual Meeting (Seattle, WA). McGill, S., Benthien, M., Castillo, B., Fitzsimmons, J., Foutz, A., Keck, D., Manduca, C., Noriega, G., Pandya, R., Taber, J., and Vargas, B., December 2017. The EarthConnections San Bernardino Alliance: Addressing Diversity in the Geosciences Using a Collective Impact Model, AGU Fall Meeting (New Orleans, LA). Merwade, V., Rajib, A., Ruddell, B., and Fox, S., December 2017. Creating Data and Modeling Enabled Hydrology Instruction Using Collaborative Approach, AGU Fall Meeting (New Orleans, LA). Mogk, D., Kastens, K., Fox, S., Fredrick, K., Tewksbury, B., and Wysession, M., 2017. On the Cutting Edge: Development of a Geosciences Community-Generated, Peer-Reviewed Teaching Activity Collection, Geological Society of America Abstracts with Programs, Vol. 49, no. 6. Ormand, C., Baer, E., Bragg, D., Eddy, P., Emerson, N., Hao, Y., Hodder, J., Iverson, E., and Macdonald, R., 2017. The Inventory of Educational Practices and the Inventory of Geoscience Department and Program Practices: Two New Instruments in Development From the SAGE 2YC Project, GSA Annual Meeting (Seattle, WA). Orr, C.H., Manduca, C., and McDaris, J., 2017. For Higher Ed portal to Resources Supporting Change from Individual to Program scales, Earth Educators' Rendezvous (Albuquerque, NM). Orr, C.H., McDaris, J., and Manduca, C., 2017. Lessons from Integrate on Program Scale Change: Synthesizing Real-World Experience, GSA Annual Meeting (Seattle, WA). Orr, C.H., Fox, S., Egger, A., and Wenner, J., 2017 Teach the Earth: Newly Envisioned Portal for Geoscience Education Resources, Geological Society of America (Seattle, WA). Orr, C.H. and J. E. Swartz. 2017. IINSPIRE-LSAMP Alliance professional development workshops in support of broadening participation in STEM. Network of STEM Education Centers, Annual meeting, New Orleans, LA. Petcovic, H., Tinigin, L., Pope, A., Bursztyn, N., Ormand, C., and LaDue, N., 2017. Pixels: How Classroom-Based and Field-Based Learning Impact Students' Sense of Scale and Understanding of Remote Sensing Imagery, GSA Annual Meeting (Seattle, WA). Riihimaki, C., LeMay, L., Dunbar, R., Ebanks, S., Gilbert, L., Macdonald, R., Ormand, C., and Weissmann, G., 2017. Preparing for the Academic Career in the Geosciences Workshop: A Success of the On the Cutting Edge Program, GSA Annual Meeting (Seattle, WA). Rutz, C., Manduca, C., and Huber, M.T., 2017. Building a Productive Culture of Teaching and learning: Contributions from Faculty Development, AACU Annual Meeting (San Francisco, CA). St. John, K., Cervato, C., Kastens, K., Macdonald, H., McDaris, J., McNeal, K., Petcovic, H., Pyle, E., Riggs, E., Ryker, K., Semken, S., and Teasdale, R., 2017 Identifying and Prioritizing Geoscience Education Research Grand Challenges: Draft Plans for a Community Research Agenda, GSA Annual Meeting (Seattle, WA). Sullivan, S,. Gold, A., Manning, C., Taylor, J., Kirk, K., Bruckner, M., Niepold, F., Lynds, S., Fox, S. and Ledley, T., 2017 NGSS With the Climate Literacy and Energy Awareness Network (CLEAN) Collection, GSA Annual Meeting (Seattle, WA). Teasdale, R., Bartley, J., Farthing, D., Manduca, C., Iverson, E., Viskupic, K., Ryker, K., McConnell, D., Bruckner, M., and McFadden, R., July 19, 2017. Reformed teaching in geoscience classrooms: How engaged are our students and what can we do to engage them more?, Earth Educators' Rendezvous (Albuquerque, NM). Viskupic, K., Teasdale, R., Ryker, K., McFadden, R., Farthing, D., Iverson, E., Bruckner, M., Manduca, C., and McConnell, D., 2017 The Effects of Discipline-Based Professional Development On Teaching Practices Observed in Undergraduate Geoscience Classrooms, GSA Annual Meeting (Seattle, WA). Wysession, M., Mogk, D., Manduca, C., Macdonald, H., and Tewksbury, B., 2017 On the Cutting Edge Emerging Theme Workshops: A Pathway for Geoeducation Innovation, GSA Annual Meeting (Seattle, WA). Arthurs, L., Caulkins, J.L., Awad, A., Steer, D., Viskupic, K., Iverson, E., and Manduca, C.A., 2016. Lessons Learned from the Integrate Project: The Challenge of Integrating Systems Thinking Into College Stem Curricula, Geological Society of America Abstracts with Programs, Vol. 48, no. 7. Atkins, R.M., McNeal, K.S., Ormand, C.J., and Shipley, T.F., 2016. Student Visual Navigation of Geologic Block Diagrams: Implications for Teaching Spatial Skills in the Undergraduate Classroom, Geological Society of America Abstracts with Programs, Vol. 48, no. 7. Atit, K., Ormand, C.J., Shipley, T.F., Tikoff, B., Dutrow, B., Goodwin, L., Hickson, T.A., Gagnier, K.M., and Resnick, I., 2016. Does context matter? Investigating the improvement of domain-general vs. domain-specific spatial skills in upper level geology courses, Spatial Cognition conference (Philadelphia, PA). Baer, E., Emerson, N.R., Hodder, J., MacDonald, H.R., and McDaris, J.R., 2016. SAGE 2YC: Two-Year College Geoscience Faculty as Change Agents, Earth Educators' Rendezvous (Madison, WI). Baer, E., Emerson, N.R., Hodder, J., MacDonald, H.R., McDaris, J.R., and Ormand, C.J., 2016. Community College Geoscience Faculty as Change Agents, Geological Society of America Abstracts with Programs, Vol. 48, no. 7. Baldassari, C., Manduca, C., McConnell, D., and Oches, R., 2016, Connecting Science to Societal Issues: Building Capacity for Interdisciplinary Education, AACU/PKAL Transforming Undergraduate STEM Education: Implications for 21st-Century Society (Boston, MA). Ebert, J.R., 2016. Field-Based Class Research Projects and the Methods of Geoscience,Geological Society of America Abstracts with Programs, Vol. 48, no. 7. Emerson, N.R., Baer, E., MacDonald, H.R., Ormand, C.J., Layou., K.M., and Hodder, J., 2016. Supporting Geoscience Students Through The 2YC to 4YCU Transfer Process, Geological Society of America Abstracts with Programs, Vol. 48, no. 7. Fox, S.P., McFadden, R.R., Manduca, C.A., and Egger, A.E., 2016. Teach the Earth's Decentralized Model for Centralized Educational Resource Discovery, Geological Society of America Abstracts with Programs , Vol. 48, no. 7. Garnier, B., Chang, M., Ormand, C.J., Tikoff, B., and Shipley, T., 2016. CogSketch Worksheet: Promoting Sketching in the Geosciences with Interactive Technology, Earth Educators' Rendezvous (Madison, WI). Garnier, B.C., Ormand, C.J., Matlen, B., Shipley, T.F., and Tikoff, B., 2016. Promoting Sketching in Introductory Geoscience Courses: An Interdisciplinary Approach to Designing and Developing Cogsketch Geoscience Worksheets, Geological Society of America Abstracts with Programs, Vol. 48, no. 7. Gold, A., Pendergast, P., Stempien, J., and Ormand, C.J., 2016. The Importance of Spatial Reasoning Skills in Undergraduate Geology Students and the Effect of Weekly Spatial Skill Trainings, European Geosciences Union General Assembly (Vienna, Austria). Gold, A.U., Pendergast, P., Ormand, C.J., Budd, D., Mueller, K., and Kravitz, K., 2016. The Importance of Spatial Reasoning Skills in Undergraduate Geology Students and the Effect of Weekly Spatial Skill Trainings-with a Specific Focus on the Gender Gap, Geological Society of America Abstracts with Programs, Vol. 48, no. 7. Herbstrith, K., 2016. Communicating your Craft: Strengthening Recognition for your Teaching, Earth Educators' Rendezvous (Madison, WI). Huyck, D.W., Bruckner, M., and Fox, S.P., 2016. Succeeding in Your Transition to Faculty Life with Support of the Community and Resources on the SERC Website, Earth Educators' Rendezvous (Madison, WI). Orr, C.H., Manduca, C.A., McDaris, J.R., and Baldassari, C., 2016. Models of Program - Scale Change: Common Elements in the Implementation of the InTeGrate Design Philosophy and Teaching Materials, Earth Educators' Rendezvous (Madison, WI). Orr, C.H., McFadden, R.R., Manduca, C.A., and Kempler, L.A., 2016. Resources and Approaches for Teaching Quantitative and Computational Skills in the Geosciences and Allied Fields, AGU Fall Meeting. Orr, C.H. 2016. Models of Program-Scale Change. Heads & Chairs Summit: On the Future of Undergraduate Geoscience Education. UT-Austin, TX. Iverson, E.R., 2016. How Geoscience Faculty Learn about Improving Their Teaching Practice: Lessons from Ten Years of Interviews, Earth Educators' Rendezvous (Madison, WI). Krantz, B., Ormand, C.J., and Freeman, B., 2016. Learning From the 2013 3-D Interpretation AAPG Hedberg Conference: How Geoscientists See 3-D, AAPG Annual Convention (Calgary, Alberta, Canada). MacDonald, R.H., Baer, E., Emerson, N.R., Hodder, J., McDaris, J.R., Ormand, C.J., Eddy, P., Bragg, D., Iverson, E., and McCambly, H., 2016. Working for Systemic Change in Geoscience Programs in Two-Year Colleges, Geological Society of America Abstracts with Programs, Vol. 48, no. 7. Manduca, C.A., 2016. Geoscience Education and the Larger STEM Agenda, Earth Educators' Rendezvous (Madison, WI). Manduca, C.A., Bralower, T.J., Doser, D.I., Egger, A.E., and McConnell, D., 2016. Integrate: Interdisciplinary Teaching About the Earth for a Sustainable Future, Geological Society of America Abstracts with Programs, Vol. 48, no. 7. Manduca, C.A., and Iverson, E., 2016. Evaluation and Assessment in Grant Development, SCAFRO Annual Meeting (Carleton College). McConnell, D.A., Birnbaum, S.J., Chapman, L.Y., Czajka, C.D., Iverson, E., Manduca, C.A., Nagy-Shadman, E.A., Pelch, M.A., Sheriff, K., and Steer, D.N., 2016. Integrate: Adapting Customizable Resources for Introductory Courses Seeking to Emphasize the Link Between Science and Society, Geological Society of America Abstracts with Programs, Vol. 48, no. 7. McDaris, J.R., and Manduca, C.A., 2016. Showcasing Approaches to Inclusivity and Broadening Participation in Geoscience and STEM, Geological Society of America Abstracts with Programs, Vol. 48, no. 7. McFadden, R., Manduca, C.A., Newman, A., and Orr, C.H., 2016. Showcasing the InTeGrate STEP Center Principles and Implementation Programs Through Interactive Webinars and Websites, AGU Fall Meeting. McFadden, R.R., Newman, A.C., and Manduca, C.A., 2016. Broadening Adoption of Teaching about the Earth in a Societal Context with the Integrate Webinar Series, Geological Society of America Abstracts with Programs, Vol. 48, no. 7. Nagy-Shadman, E.A., McConnell, D.A., Czajka, C.D., and Manduca, C.A., 2016. Integrate: Teaching about Minerals, Plate Boundaries, Hazards, Soils, and Climate in the Context of Societal Issues in Introductory Courses at a Two-year College, Geological Society of America Abstracts with Programs, Vol. 48, no. 7. Ormand, C.J., and Riggs, E., 2016. Spatial Reasoning in the Geosciences, Earth Educators' Rendezvous (Madison, WI). Ormand, C.J., Shipley, T.F., and Tikoff, B., 2016. Ten Years of SILC Research on Spatial Thinking and Learning in Geoscience: What We've Learned and Produced, Geological Society of America Abstracts with Programs, Vol. 48, no. 7. Ormand, C.J., Shipley, T.F., Tikoff, B., Dutrow, B.L., Goodwin, L.B., Hickson, T.A., Atit, K.R., Gagnier, K., and Resnick, I., 2016. The Spatial Thinking Workbook: Developing Students' Spatial Thinking Skills in Upper-Level Undergraduate Geology Courses Through Curricular Materials Based on Cognitive Science Research, Geological Society of America Abstracts with Programs, Vol. 48, no. 7. Petcovic, H.L., Tinigin, L., Pope, A., Bursztyn, N., Ormand, C.J., and Ladue, N., 2016. Pixels: Comparing Classroom-Based and Field-Based Learning to Investigate Students' Concepts of Pixels and Sense of Scale, Geological Society of America Abstracts with Programs, Vol. 48, no. 7. Steer, D., Awad, A., Arthurs, L., Caulkins, J.L., Viskupic, K., Iverson, E., Baldassari, C., and Manduca, C.A., 2016. Lessons Learned from the Integrate Project: Supporting Postsecondary Faculty in Their Design of Curricular Materials Connecting Geoscience and Societal Challenges, Geological Society of America Abstracts with Program, Vol. 48, no. 7. St.John, K., Kastens, K.A., MacDonald, H., McDaris, J.R., and McNeal K.S., 2016. Emerging Priorities and New Online Resources to Support Geoscience Education Researchers, Geological Society of America Abstracts with Programs, Vol. 48, no. 7. Zweifel, E., 2016. Developing Your Professional Network through the National Association of Geoscience Teachers, Earth Educators' Rendezvous (Madison, WI). Bruckner, M., Orr, C.H., and Manduca, C., 2015. Bridging Science and Public Understanding of Long-term Soil, Water, and Vegetation Monitoring: Opportunities for broader impact connections with InTeGrate, AGU Fall Meeting (San Francisco, CA). Egger, A., Bruckner, M., and Kent, M., 2015. Resources for Preparing Pre-service Teachers to Teach the NGSS, Earth Educators' Rendezvous (Boulder, CO). Fox, S., and Manduca, C., 2015. InTeGrate, K-12 Portal, Pedagogies in Action and More: Resources from SERC, American Association of Physics Teachers Summer Meeting (College Park, MD). Gagnier, K.M., Atit, K., Ormand, C.J., and Shipley, T.F., 2015. Sketching to support student comprehension of 3-dimensional diagrams: Diagrams as Vehicles, Scientific Reasoning Conference (Pittsburgh, PA). Geraghty Ward, E., Iverson, E., Steer, D., and Manduca, C., 2015. Assessing validity of the Geoscience Literacy Exam (GLE), Earth Educators' Rendezvous (Boulder, CO). Gold, A., Stempien, J., Ormand, C., Budd, D., Mueller, K., Kravitz, K., Quintanilla, A., and Stroh, J., 2015. Differences in Spatial Reasoning Skills in Undergraduate Geology Students and the Effect of Weekly Spatial Skill Trainings, Earth Educators' Rendezvous (Boulder, CO). Gross, D., Willett, G., Iverson, E., and Manduca, C., 2015. Broadening Participation through a Community-Building Approach in STEM: Carleton College's Cohort Program Components and Evaluation, Earth Educators' Rendezvous (Boulder, CO). Egger, A.E., Awad, A., Sullivan, S., Orr, C.H., and Ma, V., 2015. Building a sustainable future: The imperative and opportunities to engage all future teachers in Earth science, Geological Society of America Abstracts with Programs, Vol. 47, no. 7, pp. 619. Egger, A.E., Baldassari, C., Doser, D.I., Herbstrith, K., Iverson, E., Lee, S., Manduca, C.A., Mcconnell, D.A., Pelch, M.A. and Steer, D.N., 2015. Taking a systems approach to supporting faculty in transforming teaching and learning, Geological Society of America Abstracts with Programs, Vol. 47, no. 7, pp. 225. Herbstrith, K., 2015. Communicating The Need For Earth Literacy Across The Curriculum, AGU Fall Meeting (San Francisco, CA). Orr, C.H., Gosselin, D., and McDaris, J., 2015. Building Interdisciplinary Sustainability Programs, Earth Educators' Rendezvous (Boulder, CO). Iverson, E., Bruckner, M., Larsen, K., and Manduca, C., 2015. Replicating the effects ongoing treatment through sustained networks: the Impact of the On the Cutting Edge Professional Development Program for Geoscience Faculty (CE) on faculty learning about teaching, Earth Educators' Rendezvous (Boulder, CO). Lauer, M., and Fox, S., 2015. Tools Supporting Open-Access and Community Developed Curriculum, Earth Educators' Rendezvous (Boulder, CO). Ledley, T., Grogan, M., Niepold, F., Manduca, C., Gold, A., Fox, S., and Sullivan, S., 2015. The Climate Literacy and Energy Awareness Network (CLEAN), Earth Educators' Rendezvous (Boulder, CO). Luo, W., Pelletier, J., Duffin, K., Ormand, C.J., Hung, W., Iverson, E., Zhai, X., Whalley, K., Gallaher, C., Furness, W., and Shernoff, D., 2015. Computer Simulation Significantly Enhances Students' Learning of Landform Evolution, AAG (Chicago, IL). Luo, W., Pelletier, J., Duffin, K., Ormand, C.J., Hung, W., Iverson, E., Shernoff, D., Zhai, X., Whalley, K., Gallaher, C., and Furness, W., 2015. Web-based Interactive Landform Simulation Model - Grand Canyon (WILSIM-GC) and Its Advantages in Enhancing Students' Learning, CSDMS Annual Meeting (Boulder, CO). Kent, M., Egger, A., Bitting, K.S., Cook, G.W., and Manduca, C.A., 2014. Getting The Most Out Of Your Introductory Courses: Web-Based Resources To Help You Transform Your Course, Abstracts with Programs, Vol. 46, no. 6, pp. 736. Kirk, K.B., Kulick, K.M., Defur, S.H., McLaughlin, V., McDaris, J.R., Baer, E.M.D., and Macdonald, R.H., 2015. Teaching the Students You Have: Insights and Strategies for Inclusive Instruction (Acrobat (PDF) 2.6MB Feb22 16), Geological Society of America Abstracts with Programs, Vol. 47, no. 7, pp. 107. Macdonald, H., Blodgett, R., McDaris, J., Baer, E., and Hodder, J., 2015. A Program Model for Engaging a Community: Supporting and Advancing Geoscience Education in Two-year Colleges, Earth Educators' Rendezvous (Boulder, CO). Manduca, C.A., Blockstein, D., Bralower, T.J., Davis, F., Doser, D.I., Egger, A.E., Gosselin, D.C., Iverson, E., Kastens, K.A., and Orr, C.H., 2015. Linking geoscience and societal issues: a strategy for making geoscience more central in higher education, Geological Society of America Abstracts with Programs, Vol. 47, no. 7, pp. 258. Manduca, C.A., Bralower, T.J., Egger, A.E., Mcconnell, D.A., Gosselin, D.C., Taber, J., and Steer, D., 2015. Developing Capacity to Address Societal Issues: Principles and Examples From InTeGrate, Geological Society of America Abstracts with Programs, Vol. 47, no. 7, pp. 688. Manduca, C., and Kastens, K., 2015. InTeGrate: A Systems Approach to Transforming Higher, Education Earth Educators' Rendezvous (Boulder, CO). Manduca, C., MacDonald, H., McDaris, J., and Weissman, G., 2015. Supporting Success for all Students, AGU Fall Meeting (San Francisco, CA). Manduca, C. and Kastens, K., 2015. InTeGrate: A Systems Approach to Transforming Higher Education, Earth Educators' Rendezvous (Boulder, CO). Manduca, C., McConnell, D., Bruckner, M., and Iverson, E., 2015. On the Cutting Edge: Demonstrating Impact on Teaching, Earth Educators' Rendezvous (Boulder, CO). Manduca, C., and Mosher, S., 2015. What does it mean to be a geoscientist? Is there a core curriculum?, Earth Educators' Rendezvous (Boulder, CO). McDaris, J., Manduca, C., MacDonald, H., and Iverson, E., 2015. Addressing Issues of Broadening Participation Highlighted in the Report on the Future of Undergraduate Geoscience Education, AGU Fall Meeting (San Francisco, CA). McDaris, J., Macdonald, H., and Manduca, C., 2015. Broadening Access to STEM and Geoscience through Support for the Whole Student, Earth Educators' Rendezvous (Boulder, CO). Mogk, D., Manduca, C., and Kastens, K., 2015. Geoscience Education Research: A Brief History, Context and Opportunities, Earth Educators' Rendezvous (Boulder, CO). Mogk, D., Kieffer, S., Geissman, J., and Bruckner, M., 2015. Teaching GeoEthics Across the Geoscience Curriculum: Need, Opportunities and Strategies, Earth Educators' Rendezvous (Boulder, CO). Ormand, C., Shipley, T.F., Dutrow, B., Goodwin, L., Hickson, T.A., Tikoff, B., Atit, K., Gagnier, K.M., and Resnick, I., 2015. Teaching Spatial Thinking in Undergraduate Geology Courses Using Tools and Strategies from Cognitive Science Research (Acrobat (PDF) 2.2MB Dec28 15), American Geophysical Union annual fall meeting (San Francisco, CA). Orr, C.H., Manduca, C., and Bruckner, M., 2015. Bridging Science and Public Understanding of Water-Energy Nexus: Opportunities for broader impact connections with InTeGrate, AGU Fall Meeting (San Francisco, CA). Petcovic, H., Ormand, C.J., and Krantz, R.W., 2015. Using Mixed Methods to Explore Field Sketching: An Example from the Hat Creek Fault Zone, Earth Educators' Rendezvous (Boulder, CO). Petcovic, H., Pope, A., Tinigin, L., Ormand, C.J., and LaDue, N.D., 2015. PIXEL: Investigating Students' Concepts of Pixels and Sense of Scale in the Field, Geological Society of America annual meeting (Baltimore, MD). Pope, A., Tinigin, L., Petcovic, H.L., Ormand, C.J., and LaDue, N.D., 2015. PIXEL: Investigating Students' Concepts of Pixels and Sense of Scale in the Field, American Geophysical Union annual fall meeting (San Francisco, CA). Savina, M., Iverson, E., O'Connell, K., Steer, D., and Manduca, C., 2015. A Curricular Audit Process for Faculty Developers of Student-Centered Curricula that Meld Geoscience and Societal Issues, Earth Educators' Rendezvous (Boulder, CO). Ward, E.G., Iverson, E., Steer, D., and Manduca, C., 2015. Assessing validity of the Geoscience Literacy Exam (GLE), Earth Educators' Rendezvous (Boulder, CO). Whalley, K., Luo, W., Pelletier, J., Duffin, K., Ormand, C., Shelhamer, A., Darling, A., Hung, W., Shernoff, D., Zhai, X., Iverson, E., Furness, W., Gallaher, C., MacCarragher, S., and Lotter, N., 2015. The Utilization of a Computer Simulation to Teach Landform Evolution, West Lakes Division of the Association of American Geographers regional meeting (Eau Claire, WI). Bralower, T., Bice, D., Millet, A., Oakes, R., Bruckner, M., and Iverson, E., 2014. Earth Futures: A Blended General Education Course at the Pennsylvania State University, Geological Society of America Abstracts with Programs. Bruckner, M.Z., O'Connell, K., McDaris, J.R., Kirk, K., Larsen, K., Kent, M., Manduca, C.A., Egger, A., Blockstein, D., Mogk, D.W., and Taber, J., Dec. 14-19, 2014. Infusing Sustainability Across Disciplines to Build Student Engagement, AGU 2014 Fall Meeting (San Francisco, CA). Caulkins, J., Steer, D., Manduca, C., Savina, M., and Awad, A., 2014. Student Learning in Geoscience Courses Incorporating Societal Issues and Grand Challenges Facing Society, Geological Society of America Abstracts with Programs. Egger, A.E., and Scherer, H., Nov. 7, 2014. Creating Curricula for a Sustainable Future; A team-based, Rubric-supported Approach (PowerPoint 2007 (.pptx) 20.1MB Aug11 15), AAC&U Meeting (Atlanta, GA). Gosselin, D., Danielson, A., Parnell, R., and O'Connell, K., June 11-14, 2014. Silo Busting for Dummies I: If we can so can you! Association for Environmental Studies and Sciences 2014 Conference: Welcome to the Anthropocene (New York City, NY). Hickson, T.A., Gastaldo, R.A., Gran, K., Macdonald, R.H., McDaris, J.R., and Theissen, K.M., 2014. Getting Together: Reporting on an Interdisciplinary Workshop for Sedimentary Geologists, Paleontologists, and Geomorphologists, Geological Society of America Abstracts with Programs, Vol. 46, no. 6, pp. 437. Kasten, K., Baldassari, C., DeLisi, J., and Manduca, C., Dec. 15-19, 2014. Using Complex Thinking to Frame the Evaluation of a Complex Educational Intervention: InTeGrate as a Case Study (PowerPoint 2007 (.pptx) 6.3MB Dec22 14), AGU 2014 Fall Meeting (San Francisco, CA). Macdonald, R.H., Baer, E.M.D., Blodgett, R.H., Hodder, J., and McDaris, J.R., 2014. Transforming a Community: Supporting and Advancing Geoscience education in Two-year Colleges,Geological Society of America Abstracts with Programs , Vol. 46, no. 6, pp. 599. Macdonald, R.H., McDaris, J.R., Kulick, K.M., Baer, E.M.D., Blodgett, R.H., and Hodder, J., 2014. Supporting Student Success in Geoscience at Two-year Colleges, Geological Society of America Abstracts with Programs, Vol. 46, no. 6, pp. 244. Macdonald, H., Manduca, C., Mogk, D., Tewksbury, B., Fox, S., Iverson, E., Beane, R., Mcconnell, D., Wiese, K., and Wysession, M., 2014. On the Cutting Edge: Workshops, Online Resources, and Community Development, AGU Fall Meeting (San Francisco, CA). Manduca, C., Phillips, M., Mogk, D., and Gosselin, D., 2014. Building Transdisciplinary Teaching Capacity, Geological Society of America Abstracts with Programs, Vol. 46, no. 6, pp. 50. Manduca, C., June 2014. Fostering Knowledge Integration: Interdisciplinarity and Data in the Classroom, BioQuest Workshop, University of Delaware (Newark, DE). Manduca, C.A., Iverson, E., Mcconnell, D.A., Bruckner, M.Z., Greenseid, L., Macdonald, H.R., Tewksbury, B., and Mogk, D.W., 2014. On The Cutting Edge: Combining Workshops And On-Line Resources To Improve Geoscience Teaching, Abstracts with Programs, Vol. 46, no. 6, pp. 600. Mogk, D.W., Wysession, M., Beauregard, A., Reinen, L., Surpless, K., O'Connell, K., and McDaris, J.R., Dec. 14-19, 2014. Undergraduate Research in Earth Science Classes: Engaging Students in the First Two Years, Abstract ED21D-3479, AGU 2014 Fall Meeting (San Francisco, CA). O'Connell, K., Gosselin, D., and Manduca, C., 2014. Supporting interdisciplinary teaching about the Earth with the InTeGrate website, Association for Environmental Studies and Sciences Annual Meeting (New York, NY). Orr, C.H., Iverson, E., Mcconnell, D., and Manduca, C., 2014. The Challenge And Opportunity Of Engaged Teaching At Research Universities, Abstracts with Programs, Vol. 46, no. 6. Ryker, K., Iverson, E., Bruckner, M.Z., Mcconnell, D., Manduca, C., and Larsen, K., 2014. Connecting Beliefs To Action: How Geoscience Faculty Perceptions Of Their Professional Environment Impact Teaching, Geological Society of America, Abstracts with Programs, Vol. 46, no. 6. Teasdale, R., Manduca, C., Mcconnell, D., Bartley, J., Bruckner, M., Farthing, D., Iverson, E., and Viskupic, K., 2014. Observations of Undergraduate Geoscience Instruction in the US: Measuring Student Centered Teaching, AGU Fall Meeting (San Francisco, CA). Viskupic, K., Steer, D., Kortz, K. M., Perkins, D., Wirth, K., Herbert, B., Singer, J., and Manduca, C.A., 2014. Monitoring Undergraduate Growth Through The Major Using Embedded Assessment Questions, Abstracts with Programs, Vol. 46, no. 6. Wiese, K., and Mcconnell, D., 2014. Designing And Using Videos In Undergraduate Geoscience Education – A Workshop And Resource Website Review, Abstracts with Programs, Vol. 46, no. 6. Asher, P.M., Ormand, C.J., Macdonald, R.H., and Keane, C.M., 2013. The Role of Professional Societies in Supporting Earth and Space Science Departments, Geological Society of America Abstracts with Programs, Vol. 45, no. 7, pp. 206. Baer, E.M.D., Blodgett, R.H., Hodder, J., Macdonald, R.H., and McDaris, J.R., 2013. Faculty Professional Development as a Strategy to Sustain Geoscience Programs in Two-Year Colleges, Geological Society of America Abstracts with Programs, Vol. 45, no. 7, pp. 207. Borowski, W.S., Baer, E.M.D., and Wenner, J.M., 2013. Using The Math You need Modules in a General Education, Oceanography Course, Geological Society of America Abstracts with Programs, Vol. 45. no. 7, pp. 311. Bruckner, M., Iverson, E., Manduca, C.A., McConnell, D.A., Bartley, J.K., Farthing, D.J., Teasdale, R., and Viskupic, K., 2013. Using the On the Cutting Edge RTOP instrument to Characterize how Geoscience is Taught, Geological Society of America Abstracts with Programs'], Vol. 45, no. 7, pp. 313. Garnier, B., Ormand, C.J., Tikoff, B., Shipley, T.F., and Forbus, K.D., 2013. Using Sketching Software with a Virtual Tutor to Increase Sketching and Spatial Skills Development in a Classroom Environment, Geological Society of America Abstracts with Programs, Vol. 45, no. 7, pp. 656. Gold, A.U., Ledley, T., Kirk, K.B., Sullivan, S.B., Lynds, S., and Manduca, C.A., 2013. Investigating and Supporting Energy Education as a Component of Climate Education, Geological Society of America Abstracts with Programs, Vol. 45, no. 7, pp. 502. Gosselin, D.C., Kirk, K.B., and Manduca, C.M., 2013. Preparing Students for the Complexities of Future Employment: Linking Learning Outcomes, 21st Century Competencies and the Geosciences, Geological Society of America Abstracts with Programs, Vol. 45, no. 7, pp. 875. Ledley, T.S., Gold, A.U., Niepold, F., Grogan, M., Kirk, K.B., Sullivan, S.B., Lynds, S., McCaffrey, M., Manduca, C.A., and Fox, S.P., 2013. The Climate Literacy and Energy Awareness Network (CLEAN): Leveraging Reviewed Educational Resources and a Diverse Community to Achieve Climate Literacy Goals, Geological Society of America Abstracts with Programs, Vol. 45, no. 7, pp. 501. Macdonald, R.H., Manduca, C.A., Mogk, D.W., Tewksbury, B.J., Fox, S.P., Beane, R.J., McConnell, D.A., Wiese, K., Wysession, M.E., and the SERC Webteam., 2013. On the Cutting Edge and a Decade of Transforming Geoscience Education, Geological Society of America Abstracts with Programs, Vol. 45, no. 7, pp. 732. Manduca, C.A., 2013. Considering the Whole Student, the Whole Faculty member, and the Whole Department: The Department as a Synergistic System, Geological Society of America Abstracts with Programs, Vol. 45, no. 7, pp. 63. McConnell, D.A., Egger, A.E., Fox, S.P., Iverson, E., Manduca, C.A., and Steer, D., 2013. InTeGrate: Rethinking Geoscience Instruction with the Development of Free Customizable Resources to Address Earth's Grand Challenges in Introductory Courses, Geological Society of America Abstracts with Programs, Vol. 45, no. 7, pp. 733. McDaris, J.R., Kirk, K.B., Layou, K., Macdonald, R.H., Baer, E.M., Blodgett, R.H., and Hodder, J., 2013. Supporting Geoscience Students at Two-Year Colleges (PowerPoint 2007 (.pptx) 7.3MB Dec16 13): Career Preparation and Academic Success, AGU Fall Meeting. McDaris, J.M., Nelson, T., Egger, A., Manduca, C.A., and Williams, W., 2013. Showcasing Successful Strategies for Supporting Minority Students in the Geosciences (Acrobat (PDF) 11.1MB Nov4 13), Geological Society of America Abstracts with Programs, Vol. 45, no. 7, pp. 379. Ormand, C.J., Shipley, T.F., Tikoff, B., Manduca, C.A., Dutrow, B.L., Goodwin, L.B., Hickson, T., Gagnier, K.M., and Resnick, I., 2013. Improving Spatial Visualization Skills in the Undergraduate Geoscience Classroom through Interventions Based on Cognitive Science Research, Geological Society of America Abstracts with Programs, Vol. 45, no. 7, pp. 148. Pearson, E.F., and Manduca, C.A., 2013. NAGT: Seventy-Five Years of Teachers Helping Teachers and Students, Geological Society of America Abstracts with Programs, Vol. 45, no. 7, pp. 872. Ryker, K., McConnell, D., Bruckner, M.Z., Iverson, E., and Manduca, C.A., 2013. Teaching is Believing: Pedagogical Beliefs, Practices, and Professional Development, Geological Society of America Abstracts with Programs, Vol. 45, no. 7, pp. 470. Sloan, V., Gold, A.U., Sullivan, S.B., Oonk, D., Lynds, S., Ledley, T.S., and Manduca, C.A., 2013. Reaching Middle and High School Teachers through Email Lists, Facebook, and Web Postings: The results of Sharing CLEAM Climate and Energy Online Teaching Resources, Geological Society of America Abstracts with Programs, Vol. 45, no. 7, pp. 502. Sullivan, S.B. and Manduca, C.A., 2013. National Association of Geoscience Teachers (NAGT) Support for the Next Generation Science Standards, Geological Society of America Abstracts with Programs, Vol. 45, no. 7, pp. 63. Taber, J., Santi, P., Manduca, C.A., Doser, D., Burian, S.J., Bruckner, M.Z., and Anagnos, T., 2013. Bringing Engineers and geoscientists Together to Improve Undergraduate Teaching about Sustainability, Geological Society of America Abstracts with Programs, Vol. 45, no. 7, pp. 204. Tewksbury, B.J., 2013. 50 Years of Progress in how Undergraduate Geoscience is Taught: Reflections on the Evolution of Agents of Change, Geological Society of America Abstracts with Programs, Vol. 45, no. 7, pp. 732. Tewksbury, B.J., Manduca, C.A., Mogk, D.W., and Macdonald, R.H., 2013. Geoscience Education for the Anthropocene 2013, Geological Society of America Abstracts with Programs, Vol. 45, no. 7, pp. 184. Wenner, J.M., Baer, E.M.D., and Burn, H.E., 2013. Successful Mathematics Preparation for Undergraduate Geoscience Courses Using The Math You Need, When You Need It Across Dozens of Courses and Institutions, Geological Society of America Abstracts with Programs, Vol. 45, no. 7, pp. 311. Bralower, T.J., 2012. Earth Futures: A General Sustainability Course at The Pennsylvania State University. Buhr, S.M., Ledley, T.S., Gold, A.U., Manduca, C., Fox, S.P., Kirk, K., Grogan, M., Niepold, F., Lynds, S., and Howell, C., 2012. Climate Literacy and Energy Awareness Network (CLEAN) – Supporting Teacher's Efforts to Prepare Students to Address Environmental Challenges, Geological Society of America Abstracts with Programs, Vol. 44. no. 7, pp. 351. Doser, D., July 2012. UT El Paso-El Paso Community College Activities, SAGE 2YC program workshop. Doser, D., and Villalobos, J., Dec. 3-7, 2012. Providing Bridges from 2YC to 4YC in the El Paso Region, AGU 2012 Fall Meeting (San Francisco, CA). Doser, D., and Villalobos, J., July 2012. Unique Research Experiences for two-year College Faculty and Students, AGU sponsored workshop. Doser, D., and Villalobos, J., (Accepted) Mentoring to Strengthen the 2-Yr to 4-Yr Pipeline of Geology Students, 6th annual Mentoring Conference at the University of New Mexico. Egger, A., Manduca, C.A., and Mogk, D., Nov. 4-7, 2012. Teaching the methods of geoscience: A critical component of teacher preparation program, Geological Society of America Abstracts with Programs, Vol. 44. no. 7, pp. 516, GSA Annual Meeting (Charlotte, NC). Egger, A., Oct. 25-27, 2012. Pop-up Talk (PowerPoint 2007 (.pptx) 219kB Aug15 13) on GeoPRISMS, AGU Town Hall (Morrison, NJ). Egger, A., 2012. Building Students' Capacity for Interdisciplinary Research by Changing the Way We Teach: New Resources from Integrate (Acrobat (PDF) 2MB Aug15 13), Council for Undergraduate Research Conference, The College of New Jersey. Fox, S., Manduca, C.A., and Iverson, E.A., Dec. 3-7, 2012. A Model Collaborative Platform for Geoscience Education (Acrobat (PDF) 11.4MB Mar6 13), Abstract N51A-1686 AGU 2012 Fall Meeting (San Francisco, CA). Iverson, E., 2012. When a Website is Part of Program Evaluation: A Three Staged Approach, Evaluation 2012: American Evaluation Association Annual Meeting (Minneapolis, MN). Iverson, E., McMartin, F., Morgan, G., Morrill, J., and Larsen, K., 2012. Evaluating Faculty and Student Use of Digital Resources for Teaching and Learning, Evaluation 2012: American Evaluation Association Annual Meeting (Minneapolis, MN). Kirk, K.B., Buhr, S., and Cook, J., 2012. Teaching Climate Controversies: Lessons Learned from the CLEAN Climate Communications Workshop, Geological Society of America Abstracts with Programs, Vol. 44. no. 7, pp. 46. Manduca, C.A., Bralower, T.J., and Egger, A.E., Dec. 3-7, 2012. InTeGrate: Interdisciplinary Teaching of Geoscience for a Sustainable Future, Abstract TH22L AGU 2012 Fall Meeting (San Francisco, CA). McDaris, J.R., Dec. 3-7, 2012. Online Resources for Teaching Geoscience in the Field (Acrobat (PDF) 3.6MB Mar4 13), Abstract ED53B-0927 AGU 2012 Fall Meeting (San Francisco, CA). McDaris, J.R., Tewksbury, B.J., and Wysession, M.E., Dec. 3-7, 2012. Using Grand Challenges For Innovative Teaching in Structural Geology, Geophysics, and Tectonics, Abstract ED43E-01. AGU 2012 Fall Meeting (San Francisco, CA). Manduca, C.A., Bralower, T.J., Egger, A.E., Iverson, E., McConnell, D.A., Mogk, D.W., and Wiese, K., 2012. InTeGrate: An NSF STEP Center Addressing Climate Literacy and Sustainability, Geological Society of America Abstracts with Programs, Vol. 44. no. 7, pp. 351. Manduca, C.A., Bralower, T.J., Egger, A.E., Fox, S., Ledley, T.S., Macdonald, H., Mcconnell, D.A., Mogk, D.W., and Tewksbury, B.J., Dec. 3-7, 2012. Developing A Large-Scale, Collaborative, Productive Geoscience Education Network, Abstract ED44A-07. AGU 2012 Fall Meeting (San Francisco, CA). Mogk, D.W., Wiese, K., Castendyk, D., and McDaris, J.R., Dec. 3-7, 2012. Teaching Environmental Geology in the 21St Century: A Workshop Report Abstract ED51E-04, AGU 2012 Fall Meeting (San Francisco, CA). Nagy-Shadman, E.A., 2012. Stimulating Interest of Non-Science Majors with Course Activities that are Relevant to their own Surroundings and Lives, Geological Society of America Abstracts with Programs, Vol. 44. no. 7, pp. 203. O'Connell, K., Bruckner, M.Z., Buhr, S.M., Gosselin, D.C., Kirk, K.B., Larsen, K., Ledley, T.S., Manduca, C.A., Mogk, D.W., and Wiese, K., 2012. Sustainability and Climate Change Teaching Resources, Geological Society of America Abstracts with Programs, Vol. 44. no. 7, pp. 371. Ormand, C.J., Manduca, C.A., Semken, S.C., and Crespi, E., 2012. Teaching About Rates and Time: Challenges and Resources (Acrobat (PDF) 5.2MB Mar7 13), American Geophysical Union fall meeting (San Francisco, CA). Shipley, T.F., Atit, K., Manduca, C.A., Ormand, C.J., Resnick, I., and Tikoff, B., 2012. Understanding geological processes: Visualization of rigid and non-rigid transformations, American Geophysical Union fall meeting (San Francisco, CA). Steer, D., Iverson, E., and Manduca, C.A., 2012. Developing a Geoscience Literacy Exam for Assessing Students' Earth, Ocean, Atmospheric and Climate Science Literacy, Geological Society of America Abstracts with Programs, Vol. 44. no. 7, pp. 351. Baer, E.M., Macdonald, H., McDaris, J.R., Granshaw, F.D., Wenner, J.M, Hodder, J., van der Hoeven Kraft, K., Filson, R.H., Guertin, L.A., and Wiese, K., Dec. 5-9, 2011. Professional Development Opportunities for Two-Year College Geoscience Faculty: Issues, Opportunities, and Successes, Abstract ED42A-05. AGU 2011 Fall Meeting (San Francisco, CA). Fox, S., Iverson, E.A., Manduca, C.A., Kirk, K.B., McDaris, J.R., Ormand, C.J., and Bruckner, M.Z., Dec. 5-9, 2011. Supporting Faculty Learning About Teaching: The On the Cutting Edge Website, Abstract ED23A-0612, AGU 2011 Fall Meeting (San Francisco, CA). Fox, S., July 12-15, 2011. Data Quality and Education, Invited Panel Presentation at the 2011 ESIP Summer meeting (Santa Fe, NM). Gold, A.U., Ledley, T.S., Kirk, K.B., Grogan, M., McCaffrey, M.S., Buhr, S.M., Manduca, C.A., Fox, S., Niepold, F., Howell, C., and Lynds, S.E., Dec. 5-9, 2011. Addressing climate and energy misconceptions – teaching tools offered by the Climate Literacy and Energy Awareness Network, Abstract ED11B-0782. AGU 2011 Fall Meeting (San Francisco, CA). Kirk, K.B., 2011. Key Strategies for Designing Online Courses from On the Cutting Edge, Geological Society of America Abstracts with Programs, Vol. 43. no. 5, pp. 69. Kirk, K.B., Wiese, K., Manduca, C.A., and Ledley, T.S., 2011.Supporting Undergraduate Research in Climate and Energy with Professional Development for Faculty, Geological Society of America Abstracts with Programs, Vol. 43. no. 5, pp. 255. Van der Hoeven Kraft, K., Guertin, L.A., Filson, R.H., Macdonald, H., and McDaris, J.R., Dec. 5-9, 2011. Issues, Challenges, and Opportunities in Geoscience Education and Broadening Participation in the Geosciences at Two-year Colleges (Invited), Abstract ED11E-07, AGU 2011 Fall Meeting (San Francisco, CA). Larsen, K., Bohacek, P.H., Kirk, K.B., Manduca, C.A., Ledley, T.S., and Schmitt, L., 2011. K-12 Science: A New SERC Portal to Classroom Activities and Pedagogic Guidance, Geological Society of America Abstracts with Programs, Vol. 43. no. 5, pp. 536. Ledley, T.S., McCaffrey, M.S., Gold, A.U., Buhr, S., Manduca, C., Fox, S.P., Kirk, K.B., Grogan, M., Niepold, F., Lynds, S.E., and Howell, C., Dec. 5-9, 2011. Climate Literacy and Energy Awareness Network (CLEAN) - Supporting the Scientists and Citizens of Tomorrow, Abstract ED24A-03. AGU 2011 Fall Meeting (San Francisco, CA). Ledley, T.S., McCaffrey, M.S., Gold, A.U., Buhr, S., Manduca, C., Fox, S.P., Kirk, K.B., Grogan, M., Niepold, F., and Howell, C., 2011. The Climate Literacy and Energy Awareness Network (CLEAN) - Facilitating Climate and Energy Literacy, Geological Society of America Abstracts with Programs, Vol. 43. no. 5, pp. 571. Macdonald, H., Manduca, C.A., Ormand, C.J., Dunbar, R.W., Beane, R.J., Bruckner, M., Bralower, T.J., Feiss, P.J., Tewksbury, B.J., and Wiese, K., Dec. 5-9, 2011. Preparing Future Geoscience Professionals: Needs, Strategies, Programs, and Online Resources (Invited), Abstract ED14A-01. AGU 2011 Fall Meeting (San Francisco, CA). Manduca, C.A., Blockstein, D., Bralower, T.J., Doser, D., Egger, A.E., Feiss, P.G., Gosselin, D.C., Matson, P., McConnell, D., and Ormand, C.J., 2011. Integrating Geoscience Learning in Undergraduate Education, Geological Society of America Abstracts with Programs, Vol. 43. no. 5, pp. 350. Manduca, C.A., Cobabe-Ammann, E.A., Gross, N.A., and Connor, C., Dec. 5-9, 2011. Education, Outreach and Policy: Opportunities for Sections and Focus Groups, Abstract TH22E, AGU 2011 Fall Meeting (San Francisco, CA). Manduca, C.A., Iverson, E.A., Czujko, R., Macdonald, H., Mogk, D.W., Tewksbury, B.J., McLaughlin, J., Sanford, C., Greenseid, L., and Luxenberg, M., Dec. 5-9, 2011. Impact of the On the Cutting Edge Professional Development Program on U.S. Geoscience Faculty, Abstract ED42A-04, AGU 2011 Fall Meeting (San Francisco, CA). Manduca, C.A., Mogk, D.W., Kastens, K.A., Tikoff, B., Shipley, T.F., Ormand, C.J., and McConnell D.A., Dec. 5-9, 2011. Geoscience Education Research: The Role of Collaborations with Education Researchers and Cognitive Scientists (Invited), Abstract ED23E-02. AGU 2011 Fall Meeting (San Francisco, CA). McDaris, J.R. and Manduca, C.A., June 16-17, 2011. On the Cutting Edge: Faculty Professional Development in the Geosciences (PowerPoint 2007 (.pptx) 5.6MB Jul3 13), AACC's Broadening Impact: NSF-Funded Projects at Two-Year Colleges Conference. McConnell, D., Iverson, E., Budd, D., Henry, D., van der Hoeven Kraft, K.J., McDaris, J.R., MacDonald, H., Manduca, C., Srogi, L., and Viskupic, K., 2011. A Preliminary Snapshot of Geoscience Teaching at US Colleges and Universities, Geological Society of America Abstracts with Programs, Vol. 43. no. 5, pp. 136. Mogk, D.W., Beane, R.J., Whitney, D.L., Nicolaysen, K.E., Panero, W.R., and Peck, W.H., Dec. 5-9, 2011. Teaching Mineralogy, Petrology and Geochemistry in the 21st Century: Instructional Resources for Geoscience Faculty, Abstract ED11A-0752, AGU 2011 Fall Meeting (San Francisco, CA). Mogk, D.W., Manduca, C.A., and Kastens, K.A., Dec. 5-9, 2011. Geoscience Education Research: A Brief History, Context and Opportunities, Abstract ED23E-01, AGU 2011 Fall Meeting (San Francisco, CA). Shipley, T.F., Manduca, C.A., Ormand, C.J., and Tikoff, B., Dec. 5-9, 2011. Spatiotemporal Thinking in the Geoscience, Abstract ED23E-06, AGU 2011 Fall Meeting (San Francisco, CA). McConnell, D., Iverson, E., Budd, D., Henry, D., van der Hoeven Kraft, K.J., McDaris, J.R., MacDonald, H., Manduca, C., Srogi, L., and Viskupic, K., 2011. A Preliminary Snapshot of Geoscience Teaching at US Colleges and Universitie, Geological Society of America Abstracts with Programs, Vol. 43. no. 5, pp. 136. Teasdale, R., Budd, D., Cervato, C., Iverson, E., van der Hoeven Kraft, K.J., Manduca, C., McConnell, D.A., McDaris, J.R., Murray, D.P., and Slattery, W., 2011. Enhancing Student-Centered Teaching Practices: Approaches Developed On the New Cutting Edge Geosciences RTOP Website, Geological Society of America Abstracts with Programs, Vol. 43. no. 5, pp. 255. Wiese, K., Kirk, K.B., Manduca, C.A., Shellito, L.J., Sztein, E., and Bruckner, M.Z., Dec. 5-9, 2011. Improving Climate Science Education by Supporting Faculty: Climate Programs from On the Cutting Edge (Invited), Abstract ED14B-05, AGU 2011 Fall Meeting (San Francisco, CA). Wysession, M.E., McDaris, J.R., and Mogk, D.W., Dec. 5-9, 2011. Tools and Methods for Visualizing and Representing Seismic Waves in College Classrooms, Abstract ED51B-0744, AGU 2011 Fall Meeting (San Francisco, CA). Atit, K.R., Manduca, C.A., Ormand, C.J., Resnick, I., Shipley, T.F., and Tikoff, B., 2010. Reasoning About Sequences of Spatial Events: How Do Geologists Know What Happened First?, Geological Society of America Abstracts with Programs, Vol. 42. no. 5, pp. 587. Bruckner, M.Z., Laine, E.P., Mogk, D.W., O'Connell, S., and Kirk, K.B., Dec. 13-17, 2010. Teaching Service Learning in the Geosciences: An On the Cutting Edge Workshop Report, Abstract ED51A-0501. AGU 2010 Fall Meeting (San Francisco, CA). Gold, A.U., Ledley, T.S., McCaffrey, M.S., Buhr, S.M., Manduca, C.A., Niepold, F., Fox, S.P., Howell, C., and Lynds, S., 2010. Climate Literacy and Energy Awareness Network (CLEAN): A Rigorous Peer-Review Process for Building a New Collection of High-Quality Digital Teaching Materials on Climate and Energy Science, Geological Society of America Abstracts with Programs, Vol. 42. no. 5, pp. 495. Gold, A.U., Ledley, T.S., McCaffrey, M.S., Buhr, S.M., Manduca, C.A., Niepold, F., Fox, S., Howell, C.D., and Lynds, S.E., Dec. 13-17, 2010. Lessons Learned from a Rigorous Peer-Review Process for Building the Climate Literacy and Energy Awareness (CLEAN) Collection of High-Quality Digital Teaching Materials, Abstract ED33A-0695. AGU 2010 Fall Meeting (San Francisco, CA). Kirk, K.B., Manduca, C.A., Myers, J.D., and Loxsom, F., 2010. A Portal to Undergraduate Materials For Teaching About Energy From On the Cutting Edge, Geological Society of America Abstracts with Programs, Vol. 42. no. 5, pp. 495. Kirk, K.B., Manduca, C.A., and Hirt, W.H., 2010. Venturing Into Online Teaching? Resources From On The Cutting Edge Can Ease the Transition, Geological Society of America Abstracts with Programs, Vol. 42. no. 5, pp. 530. Ledley, T.S., McCaffrey, M.S., Buhr, S., Manduca, C.A., Fox, S., Niepold, F., and Gold, A.U. Dec. 13-17, 2010. The Climate Literacy and Energy Awareness Network (CLEAN) Pathway: Integrating Science and Solutions, Abstract ED32A-08. AGU 2010 Fall Meeting (San Francisco, CA). Manduca, C.A., Mogk, D.W., Bice, D.M., Pyle, E., and Slotta, J., Dec. 13-17, 2010. Developing Students' Understanding of Complex Systems in the Geosciences, Abstract ED23C-01. AGU 2010 Fall Meeting (San Francisco, CA). McDaris, J.R. and Macdonald, R.H., 2010. Teaching About Hazards Using Current Events, Geological Society of America Abstracts with Programs, Vol. 42. no. 5, pp. 24, presentation (PowerPoint 11.1MB Nov17 10)). McDaris, J.R., Kirk, K.B., Mogk, D.W., and Bruckner, M.Z., Dec. 13-17, 2010. Virtual Workshop Experiences for Faculty: Lessons Learned from On the Cutting Edge, Abstract ED31B-0641, AGU 2010 Fall Meeting (San Francisco, CA). Ormand, C.J., Manduca, C.A., Macdonald, R.H., Feiss, G.P., Richardson, R.M., Lee, S., and Iverson, E., 2010. Impacts of the Building Strong Geoscience Departments Visiting Workshop Program, Geological Society of America Abstracts with Programs, Vol. 42. no. 5, pp. 531. Ormand, C.J., Manduca, C.A., Shipley, T.F., and Tikoff, B., 2010. Geoscience Students' Spatial Cognition: Results from Multi-Instructional Classroom Studies, Geological Society of America Abstracts with Programs, Vol. 42. no. 5, pp. 190. Ormand, C.J., Macdonald, H., and Manduca, C.A., Dec. 13-17, 2010. The Role of Geoscience Departments in Preparing Future Geoscience Professionals, Abstract ED13A-0597, AGU 2010 Fall Meeting (San Francisco, CA). Richardson, R.M., Ormand, C.J., Macdonald, H., Dunbar, R.W., Allen-King, R.M., and Manduca, C.A., Dec. 13-17, 2010. Launching an Academic Career: On the Cutting Edge Resources for Geoscience Graduate Students, Post-Doctoral Fellows, and Early Career Faculty, Abstract ED12A-04. AGU 2010 Fall Meeting (San Francisco, CA). Williams, M.L., Mogk, D.W., and McDaris, J.R., Dec. 13-17, 2010. Understanding the Deep Earth: Slabs, Drips, Plumes and More – An On the Cutting Edge Workshop, Abstract ED44A-01, AGU 2010 Fall Meeting (San Francisco, CA). Iverson, E., and Lee, S., 2010. Using Evaluation to Help Transform Departments in the Challenging Economic Environment of Higher Education. Evaluation 2010: American Evaluation Association Annual Meeting (San Antonio, TX). Manduca, C.A., April 4, 2010. NSDL Pedagogic Service, Invited presentation to the NSDL Brownbag Webinar Series. Manduca, C.A., Bice, D., Pyle, E., Kastens, K., Mogk, D., Ormand, C., Slotta, J., and Stillings, N., 2010. Developing Geoscience Students Understanding of Complex Systems, International Geoscience Education Organization Conference (Johannesburg, SA). Manduca, C.A., New Directions in Geoscience Education, Invited Presentation for the Grand Opening of the Trail of Time at the Grand Canyon. Fox, S., April 2009. Open Pedagogy: Bringing Effective Teaching into the Open Ed Mix (PowerPoint 5MB Jul27 09), Presented at the Open CourseWare Consortium International Meeting (Monterey, Mexico). Fox, S.P., Manduca, C.A., and Kirk, K.B., 2009. New Virtual Tools for Supporting Online Communities of Educators, Geological Society of America Abstracts with Programs, Vol. 41, no. 7, pp. 501. Goodwillie, A.M., Reed, D., Ryan, J., Manduca, C.A., Hicky-Vargas, R., Goodliffe, A., and Abers, G., 2009. Bringing NSF-MARGINS Science to the Undergraduate Classroom, Geological Society of America Abstracts with Programs, Vol. 41, no. 7, pp. 96. Harwood, C.L., Ormand, C.J., Manduca, C.A., and Shipley, T.F., 2009. Differences in Development of Spatial and Object Visualization Ability in Undergraduate Geoscience Courses, Geological Society of America Abstracts with Programs, Vol. 41, no. 7, pp. 155. Iverson, E., Manduca, C.A., McDaris, J.R., and Lee, S., 2009. Refining MARGINS Mini-Lessons Using Classroom Observations, Eos Trans. AGU, Vol. 90, no. 52, Abstract ED13D-0616. poster (PowerPoint 4.3MB Jan19 10)). Kastens, K.A., and Manduca, C.A., 2009. Synthesis of Research on Thinking and Learning in the Geosciences: Developing Representational Competence, Geological Society of America Abstracts with Programs, Vol. 41, no. 7, pp. 249. Kirk, K.B., 2009. Finding Visualization Tools and Integrating them into your Classroom, Given at the 2009 Cyberinfrastructure Summer Institute for Gescientists, University of California, San Diego. Kirk, K.B., 2009. Visualization Tools for the Classroom, Given at the 2009 Cyberinfrastructure Summer Institute for Gescientists, University of California, San Diego. Kirk, K.B., 2009. The Lifestyle Project: Challenging Students to Redefine their Approach to Resource Use (Invited), Eos Trans. AGU, Vol. 90, no. 52, Abstract ED33C-01. Kirk, K.B., Manduca, C.A., Myers, J.D., and Loxom, F., 2009. Teaching about Climate Change and Energy with Online Materials and Workshops from On the Cutting Edge, Eos Trans. AGU, Vol. 90, no. 52, Abstract ED32A-03. Kirk, K.B., Manduca, C.A., Myers, J.D., Loxom, F., Mogk, D.W., and Bruckner, M.Z., 2009. Teaching About Energy with Online Materials from On the Cutting Edge, Geological Society of America Abstracts with Programs, Vol. 41, no. 7, pp. 155. Kirk, K.B., Manduca, C.A., Ormand, C.J., and McDaris, J.R., 2009. Resources for Designing, Selecting and Teaching with Visualizations in the Geoscience Classroom, Eos Trans. AGU, Vol. 90, no. 52, Fall Meet. Suppl., Abstract ED53E-01. Macdonald, H., Chan, M.A., Bierly, E.W., Manduca, C.A., and Ormand, C.J., 2009. Chair Talk: Resources to Maximize Administrative Efforts, Eos Trans, Vol. 90, no. 52, Abstract ED13C-0611. Manduca, C.A., Fox, S.P., Iverson, E.A., Kirk, K., and Ormand, C.J., 2009. Pedagogies in Action: A Community Resource Linking Teaching Methods to Examples of their Use, Eos Trans. AGU, Vol. 90, no. 52, Abstract ED23A-0527. Manduca, C.A., and Kastens, K.A., 2009. Synthesis of Research on Thinking and Learning in the Geosciences: Articulating the Nature of Geoscience Expertise, Geological Society of America Abstracts with Programs, Vol. 41, no. 7, pp. 249. Manduca, C.A., Macdonald, R.H., Ormand, C.J., and Feiss, P.G., 2009. Strengthening Geoscience Departments through Shared Knowledge, Geological Society of America Abstracts with Programs, Vol. 41, no. 7, pp. 158. Manduca, C.A., Mogk, D.W., and Kastens, K.A., 2009. Community Efforts Bringing Research on Learning to the Geosciences, Eos Trans. AGU, Vol. 90, no. 52, Abstract ED41B-0528. Mogk, D.W., 2009. Teaching Symmetry Using Kinesthetic Learning - An Exercise using "Old Time" Dances, Geological Society of America Abstracts with Programs, Vol. 41, no. 7, pp. 196. Myers, J.D., Kirk, K.B., Manduca, C.A., and Loxom, F., 2009. Teaching About Energy in Geoscience Courses: Current Research and Pedagogy - an On the Cutting Edge Workshop Report, Geological Society of America Abstracts with Programs, Vol. 41, no. 7, pp. 158. Ormand, C.J., Gentner, D., Jee, B., Shipley, T.F., Tikoff, B., Uttal, D.H., and Manduca, C., 2009. Finding Fault: Laboratory Experiments and Classroom Studies on Identifying Faults in Images, Geological Society of America Abstracts with Programs, Vol. 41, no. 7, pp. 196. Ormand, C.J., Manduca, C., Husman, J., Kraft, K.J., Mogk, D.W., and Wirth, K.R., 2009. Teaching Metacognition: A Summary of Successful Strategies, paper 237-2, 2008 "On the Cutting Edge" Workshop. Ormand, C. J., Manduca, C.A., and Macdonald, H., 2009. New Resources on the Building Strong Geoscience Departments Website, Eos Trans. AGU, Vol. 90, no. 52, Abstract ED13C-0610. Richard, G.A., and Kirk, K.B., 2009. Teaching with google Earth - an Online Guide for Educators, Geological Society of America Abstracts with Programs, Vol. 41, no. 7, pp. 502. Richardson, R.M., Eyles, C., and Ormand, C.J., 2009. Recruitment Strategies for Geoscience Majors: Conceptual Framework and Practical Suggestions, Eos Trans. AGU, Vol. 90, no. 52, Abstract ED13C-0614. Selkin, P.A., De Paor, D.G., Gobert, J., Kirk, K.B., Kluge, S., Richard, G.A., and Whitmeyer, S.J., 2009. Emerging Digital Technologies for Geoscience Education and Outreach, Geological Society of America Abstracts with Programs, Vol. 41, no. 7, pp. 165. Yacobucci, M.M., Lockwood, R., Tewksbury, B., McFadden, B., and Allmon, W., 2009. Teaching Paleontology in the 21st Century: Resource for Teaching Paleontology at the Undergraduate Level, Geological Society of America Abstracts with Programs, Vol. 41, no. 7, pp. 455. Fox, S., Cooper, S., and Rutledge, J., 2008. The Next Generation of MERLOT Learning Activities: Pedagogy in Action (Acrobat (PDF) 2.4MB Mar20 09), MERLOT International 2008 Conference. Iverson, E., Grawe, N., Manduca, C., and Fox, S., 2008. Quantitative Reasoning—Across Curriculum, Across Campus, and Beyond. Kastens, K., Manduca, C.A., Cervato, C., Frodeman, R., Goodwin, C., Liben, L.S., Mogk, D.W., Spangler, T.C., Stillings, N., and Titus, S., 2008. Synthesizing Research on Thinking and Learning in the Geosciences: An Interdisciplinary Collaborative Project, Geological Society of America paper 274-7. Kirk, K., 2008. Shortening the Distance: Considering the Affective Domain in Distance Learning, Geological Society of America paper 248-37. Kirk, K., Leckie, R.M., Manduca, C.A., Ormand, C.J., Buhr, S.M., and Reynolds, S.J., 2008. Teaching with New Tools: On-Line Data, Visualizations, Models, Geological Society of America paper 309-2. Ledley, T.S., Prakash, A., Manduca, C.A., Fox, S., Dahlman, L., Domenico, B., and Taber, M.R., 2008. Archiving Data to Facilitate its use in Education, Eos Trans. AGU, Vol. 89, no. 53, Abstract U13D-05. Macdonald, R.H., Allen-King, R.M., Wright Dunbar, R., Manduca, C.A., and Ormand, C.J., 2008. A Course of One's Own: Issues, Challenges, and Resources for Graduate Students, Postdoctoral Fellows, and Early Career Faculty, Geological Society of America Paper 159-8. Manduca, C., Fox, S., 2008. Bringing Research-based Pedagogies into Use: Digital Libraries Supporting Faculty Professional Development, National Science Digital Library 2008 Annual Meeting: STEM Research and Education in Action (Washington D.C.). Manduca, C.A., Gentner, D., Holden, M.P., Ormand, C.J., Jee, B., Sageman, B.B., Shipley, T.F., Tikoff, B., and Uttal, D.H., 2008. Geoscience Perception: Expert and Novice Experience of Graphs, Outcrops, and Landscapes, Geological Society of America Paper number 274-5. Manduca, C.A., Macdonald, R.H., Feiss, P.G., Richardson, R.M., and Ormand, C.J., 2008. Building Strong Geoscience Departments: Resources and Opportunities (Acrobat (PDF) 3.4MB Dec11 08), American Geophysical Union fall meeting (San Francisco, CA), Eos Trans. AGU, Vol. 89, no. 53, Abstract ED31A-0577. Manduca, C.A., Macdonald, R.H., Feiss, P.G., Richardson, R.M., Bralower, T.J., Eyles, C.H., and Ormand, C.J., 2008. Geoscience Departments and the Workforce: Bringing Together Student Interests and Industry Needs, Geological Society of America Paper 121-10. Mcdonald, H.R., Allen-King, R.M., Dunbar, R.W., Manduca, C.A., and Ormand, C.J., 2008. A course of Ones Own: Issues, Challenges, and Resources for Graduate Students, Postdoctoral Fellows, and Early Career Faculty, Geological Society of America Paper 159-8. Mogk, D.W., 2008. Building Bridges Between Cyberinfrastructure and Effective Instructional Practice in the Geosciences, Eos Trans. AGU, Vol. 89, no. 53, Abstract ED13A-0585. Bruihler, B., Fox, S., Manduca, C., Iverson, E., and McDaris, J., 2007. Resources for Weather and Climate Educators, 87th AMS Annual Meeting (San Antonio, TX). Kirk, K., Macdonald, H., Benison, K., Chan, M., Hickson, T., and Paola, C., 2007. Using Web-Based Resources for Teaching Sedimentary Geology, Geological Society of America Paper No. 206-56. Manduca, C.A., 2007. Pedagogic Service Project: Enriching the MERLOT Collection (PowerPoint 1.1MB Mar3 08), Spring 2007 MERLOT Editors' meeting. Manduca, C., 2007. Teach the Earth: On-line Resources for Teachers and Teachers of Teachers, Eos Trans. AGU, Vol. 88, no. 52, Abstract ED43A-03. Manduca, C., and Macdonald, H., 2007. Building Geoscience Departments for the Future, Eos Trans. AGU, Vol. 88, no. 52, Fall Meet. Suppl., Abstract ED34A-07. Manduca, C., Macdonald, H., Feiss, G., Bralower, T., Richardson, R., and Ormand, C., 2007. Building Strong Geoscience Departments for the Future, Geological Society of America Paper 79-1. Manduca, C., and McDaris, J., 2007. The NAGT Teaching in the Field Website: Sharing Pedagogy and Resources, Geological Society of America Paper 203-10. McMartin F., and Iverson, E., 2007. Developing Strategies to Encourage Use of Digital Learning Materials (PowerPoint 346kB Nov7 07), POD Network 2007 Conference (Pittsburgh, PA). McMartin, F., Iverson, E., Manduca, C., Wolf, A., Morgan, G., and Morrill, J., 2007. What do Faculty Need and Want from Digital Libraries? (Acrobat (PDF) 181kB Oct23 07), 2007 Joint Conference on Digital Libraries. Ryan, J., Manduca, C., and Marshall, J., 2007. (New Directions in Undergraduate Geoscience Education: Bringing Together Research, Education, and Technology in the Classroom and Field II Posters, Eos Trans. AGU, Vol. 88, no. 52, Fall Meet. Suppl., Abstract ED33B. Wolf, A., Iverson, E., Manduca, C., McMartin, F., Morgan, G., and Morrill, J., 2007. Use of Online Digital Learning Materials and Digital Libraries: Comparison By Discipline (Acrobat (PDF) 179kB Oct23 07), 2007 Joint Conference on Digital Libraries. Iverson, E.R., McLaughlin, J.A., and Manduca, C.A., 2006. The Logic Model as Compass: Guiding Stakeholders Through the Consequences of Evaluation (PowerPoint 1.5MB Nov29 06), American Evaluation Association 2006 Annual Conference. Bierman, P., Massey, C., and Manduca, C.A., 2006. The Textbook: Dead? or Alive!, Geological Society of America Abstracts with Programs, Vol. 38, no. 7, pp. 497. Iverson, E.R., and Cooper, S., 2006. Pedagogic Service Project: Enriching the MERLOT Collection (PowerPoint 1.6MB Aug24 06), MERLOT International 2006 Conference. Iverson, E.R., Manduca, C.A., and McLaughlin, J.A., 2006. Fostering Sustained Impact: Lessons learned from Geoscience Faculty Workshops (PowerPoint 1.4MB Oct30 06), POD Network 2006 Annual Conference. Manduca, C.A., Fox, S., and Rissler, H., 2006. DataSheets: Making Geoscience Data Easier to Find and Use, Eos Trans. AGU, Vol. 87, no. 52, Fall Meet. Suppl., Abstract ED41A-05. Manduca, C.A., and Hancock, G.S., 2006. The Quantitative Preparation of Future Geoscience Graduate Students, Eos Trans. AGU, Vol. 87, no. 52, Fall Meet. Suppl., Abstract ED11B-1193. Manduca, C.A., Savina, M., Fox, S., Iverson, E.R., and Bruihler, W., 2006. Sharing Examples of Effective Teaching On Campus and Beyond (PowerPoint 1.4MB Oct30 06), POD Network 2006 Annual Conference. McCaffrey, M.S., Ledley, T., Manduca, C., and Salmon, R., 2006. Integrating Research, Education, Outreach and Communication Through Storytelling: A Case Study in Progress, Eos Trans. AGU, Vol. 87, no. 52, Fall Meet. Suppl., Abstract ED41A-02. Wenner J.M., Manduca, C.A., and Baer, E.M., 2006. The Role of Introductory Geosciences in Students' Quantitative Literacy, Eos Trans. AGU, Vol. 87, no. 52, Fall Meet. Suppl., Abstract ED11B-1198. Wolf, A., McMartin, F., Morgan, G., Iverson, E., Manduca, C., and Morrill, J., 2006. Overcoming Barriers to Access and Use of Digital Learning Materials by Instructors in Higher Education (PowerPoint 83kB Jan20 07), WCET annual conference. Anderson. J., Bezanson, C., Moosavi, S., Reynolds, D., and Manduca, C., 2005. Preparing Teachers to Teach Earth Science, Eos Trans. AGU, Vol. 86, no. 52, Fall Meet. Suppl., Abstract ED11B-1105. Fox, S., 2005. Observing the Impact of NSDL Through Web Metrics (PowerPoint 944kB Apr21 06) Panel Presentation. 2005 NSDL Annual Meeting. Fox, S., and Manduca, C.A., 2005. Open Education for Educators: An Example from the Geosciences (PowerPoint 2.8MB Apr21 06), 2005 Open Education Conference (Utah). Iverson, E.R., Fox, S., and Manduca, C.A., 2005. Evaluating Vocabulary as a Component of Faceted Search (Acrobat (PDF) 109kB Dec12 06), 2005 NSDL Annual Meeting (Denver, CO). Klauk, E.E., and Mogk, D.W., 2005. Web-based Instructional Resources on the Impacts of Resource Development on Native American Lands, Geological Society of America Abstracts with Programs, Vol. 37, no. 7, pp. 281. Macdonald, R.H., 2005. Promoting Careers and Career Development: What Geoscience Faculty and Departments Can Do, Eos Trans. AGU, Vol. 86, no. 52, Fall Meet. Suppl., Abstract ED13B-1146. Macdonald, R.H., Dunbar, R.W., and Tewksbury, B.J., 2005. Managing your Career: On the Cutting Edge Resources for Graduate Students, Post-Doctoral Fellows, and Early Career Faculty, Geological Society of America Abstracts with Programs, Vol. 37, no. 7, pp. 281. Manduca, C.A., Fox, S., and Iverson, E.R., 2005. Starting Point: Geoscience Portal to Pedagogic Service (Acrobat (PDF) 1MB Jan20 06), 2005 NSDL Annual Meeting (Denver, CO). Manduca, C.A., and Hancock, G.S., 2005. Developing Geoscience Students' Quantitative Skills, Eos Trans. AGU, Vol. 86, no. 52, Fall Meet. Suppl., Abstract ED42A-08. Manduca, C.A., and Iverson, E.R., 2005. Understanding Faculty Work Habits as a Foundation for Professional Development (PowerPoint 1.8MB Jan18 06), POD Network 2005 Annual Conference. Manduca, C.A., Iverson, E., Fox, S., and McMartin, F., 2005. Motivating and Supporting Faculty Use of the Web: An Example from the Geosciences, MERLOT International 2005 Conference. Wolf, A., Iverson, E., McMartin, F., and Morgan, G., 2005. What do Faculty Need from Digital Libraries?, MERLOT International 2005 Conference. Manduca, C.A., 2005. (Teaching with Data, Center for Excellence in Learning and Teaching (PowerPoint 1.9MB Oct27 05), Iowa State University. Manduca, C.A., 2005. Digital Libraries: What can they do for you? (PowerPoint 2.6MB Oct27 05), Center for Excellence in Learning and Teaching, Iowa State University. Manduca, C.A., 2005. Funding Your Dreams, Center for Excellence in Learning and Teaching (PowerPoint 46kB Oct27 05), Iowa State University. Manduca, C.A., and Iverson, E., 2005. Understanding Faculty Work Habits as a Foundation for Professional Development (PowerPoint 1.8MB Nov7 05), 2005 POD Conference (Milwaukee, WI). Manduca, C.A., Iverson, E.R., Fox, S., and McMartin, F., 2005. Motivating and Supporting Faculty Use of Educational Digital Libraries: An Example from the Geosciences (Acrobat (PDF) 495kB Nov8 05), 2005 JCDL Meeting (Denver, CO). Manduca, C.A., and McDaris, j., 2005. Developing Effective On-Line Educational Resources in the Geosciences, Geological Society of America Abstracts with Programs, Vol. 37, no. 5, pp. 98. Manduca, C.A., Tewksbury, B.J., Mogk, D.W., and Macdonald, R.H., 2005. Surveying the Landscape: How Do We Teach Undergraduate Geoscience Courses, Geological Society of America Abstracts with Programs, Vol. 37, no. 7, pp. 411. Massey, C.A., Bierman, P.R., Lavoie, J., Manduca, C.A., Berrizbeitia, I., and Henry, J., 2005. Learning Visually with Historic 'Geo-Images' , Geological Society of America Abstracts with Programs, Vol. 37, no. 7, pp. 150. Ratajeski, K., Mogk, D.W., and Warnick, M.A., 2005. The Montana-Yellowstone Geologic Field Guid Database: A Digital Resource to Integrate Field-Based Research, Teaching, and Learning, Geological Society of America Abstracts with Programs, Vol. 37, no. 7, pp. 283. Wenner, J.M., Baer, E.M., and Manduca, C.A., 2005. Teaching Quantitative Literacy: A Website to Help Instructors Make Introductory Geoscience Courses More Quantitative, Geological Society of America Abstracts with Programs, Vol. 37, no. 7, pp. 157. Wenner, J.M., Manduca, C.A., and Baer, E.M., 2005. Making Time: Easy Ways to Quantitatively Teach Geologic Time in Introductory Geoscience Courses, Geological Society of America Abstracts with Programs, Vol. 37, no. 7, pp. 152. Aschoff, J., Mogk, D.W., and Manduca, C.A., 2004. Building Bridges Between Geoscience Research, Teaching and Learning with Thematics Digital Resource Collections: An Example Using the Cretacious Period, Geological Society of America Abstracts with Programs, Vol. 36, no. 5, pp. 273. Capps, D.L., Kirk, K.B., Mogk, D.W. and Manduca, C.A., 2004. Web-Based Resources to Support Teaching and Learning About the Greater Yellowstone Ecosystem, Geological Society of America Abstracts with Programs, Vol. 35, no. 5, pp. 488. Fox, S., and Manduca, C.A., 2004. Exploring Multi-Faceted Search in DLESE Specialized Collections (Acrobat (PDF) 688kB Nov8 05), 2004 DLESE Annual Meeting (Madison, WI). Karsten, J.L., and Manduca, C.A., 2004. Eliminating the OUCH in OUtreaCH, EOS Trans. AGU, Fall Meeting Supplement, Abstract OS21D-07, Vol. 85, no. 47. Macdonald, R.H., and Manduca, C.A., 2004. Characteristics of Thriving Departments and Programs: Insights from the Physics and Mathematics Communities, Geological Society of America Abstracts with Program, Vol. 36, no. 5, pp. 351. Macdonald, R.H., and Manduca, C.A., 2004. Bringing Together Teaching Materials and Pedagogic Methods in a Disciplinary Context, MERLOT International Conference (Costa Mesa, CA). Manduca, C.A., 2004. Especially for Faculty: On-line Resources Supporting Improved Geoscience Instruction (Acrobat (PDF) 2MB Nov8 05), 2004 DLESE Annual Meeting (Madison, WI). Manduca, C.A., Fox, S., Iverson, E.R., and Mogk, D.W., 2004. Using Data in the Classroom (Acrobat (PDF) 691kB Nov8 05), 2004 NSDL Annual Meeting (Chicago, IL). Manduca, C.A., Iverson, E.R., and McMartin, F. 2004. Understanding Faculty Use of the Web in Undergraduate Geoscience Education (Acrobat (PDF) 1.2MB Nov8 05), 2004 DLESE Annual Meeting (Madison, WI). Manduca, C.A., Macdonald, R.H., Mogk, D.W., Tversky, B.J., Slotta, J.D., and Crabaugh, J., 2004. Teaching Geoscience with Visualizations: Using Images, Animations and Models Effectively - A Workshop Report, NAGT On the Cutting Edge Workshop (Northfield, MN). Manduca, C.A., and Mogk, D.W., 2004. Teaching with Data: Resources for Designing Effective Activities, EOS Trans. AGU, Fall Meet. Suppl., Abstract ED32A-02, Vol. 85, no. 47. McDaris, J.R., Fox, S., and Manduca, C.A., June 2004. Supporting Reusability (PowerPoint 1022kB Oct26 05), 2004 Joint Conference on Digital Libraries (Tucson, AZ). McDaris, J.R., and Manduca, C.A., 2004. Developing Effective Online Learning Resources in the Geosciences, DLESE Annual Meeting (Madison WI). McDaris, J.R., and Manduca, C.A., 2004. EOS Trans. AGU, Fall Meeting Supplement, Abstract ED41A-0246, Vol. 85, no. 47. McDaris, J.R., and Manduca, C.A., 2004. 2004 NSDL Annual Meeting (Chicago, IL). Mogk, D.W., and Manduca, C.A., 2004. Rates, Fluxes, and Cycling in the Earth System: What do we Know, What are we Teaching?, EOS Trans. AGU, Fall Meeting Supplement, Abstract ED13A-0714, Vol. 85, no. 47. Mogk, D.W., and Manduca, C.A., 2004. Achieving Broader Impacts Through Partnering in a Digital World, EOS Trans. AGU, Fall Meeting Supplement, Abstract OS23A-1285, Vol. 85, no. 47. Ruzek, M., and Manduca, C.A., 2004. Earth System Science in a Nutshell: A Starting Point Module, EOS Trans. AGU, Fall Meeting Supplement, Abstract ED43B-0276, Vol. 85, no. 47. Teed, R., and Manduca, C.A., 2004. Teaching with Games: Online Resources and Examples for the Entry Level, EOS Trans. AGU, Fall Meeting Supplement, Abstract ED41A-0250, Vol. 85, no. 47. Teed, R., and Manduca, C.A., 2004. Using an Earth History Approach: A Starting Point Module for Faculty (Acrobat (PDF) 8.8MB Nov8 05), 2004 DLESE Annual Meeting (Madison, WI). Tewksbury, B.J., and Macdonald, R.H., 2004. On the Cutting Edge Workshop on Effective and Innovative Course Design: A Model for Designing Rigorous Introductory Courses, EOS Trans. AGU, Fall Meeting Supplement, Abstract ED41A-0243, Vol. 85, no. 47. Geary, E., Aivazian, B., Manduca, C.A., and Mogk, D.W., 2003. The DLESE Community Services Center, Eos Trans. AGU, Vol. 85, no. 46, Fall Meet. Suppl., Abstract ED11A-06. Geary, E., 2003. The Delase Community Services Center: Supporting New Opportunities for Using High Quality Digital Resources in Diverse Educational Settings, Geological Society of America Abstracts with Programs, Vol. 35, no. 6, pp. 568. Ledley, T.S., Dahlman, L., McAuliffe, C., Haddad, N., Manduca, C.A., Fox, S., Blaha, D., Freuder, R., and Downs, R., 2003. The Earth Exploration Toolbook: Facilitating the Use of Data to Teach Earth Science Processes, Geological Society of America Abstracts with Programs, Vol. 35, no. 6, pp. 115. Ledley, T.S., Dahlman, L., McAuliffe, C., Haddad, N., Manduca, C.A., Fox, S., Blaha, D., Freuder, R., and Downs, R., 2003. Eos Trans. AGU, Vol. 84, no. 46, Fall Meet. Suppl., Abstract ED31D-1183. Manduca, C.A., 2003. Sharing Teaching Materials and More: New Opportunities for Placing DLESE Resources in Context, Geological Society of America Abstracts with Programs, Vol. 35, no. 6, pp. 568. Manduca, C.A., and Fox, S., 2003. Integrated Sites/Distributed Authors: SERC Web-based Authoring Environment (PowerPoint 2.4MB Nov7 05), 2003 NSDL Annual Meeting (Washington D.C). Manduca, C.A., and Fox, S., 2003. Earth Exploration Toolbook: Step-by-Step Instructions for Using Scientific Tools and Datasets, National Science Teachers Association, Minneapolis Area Convention. Manduca, C.A., and Fox, S., 2003. Promoting Change in Undergraduate Geoscience Education - Examples from SERC (Acrobat (PDF) 412kB Nov8 05), 2003 DLESE Annual Meeting (Boulder, CO). Manduca, C.A., and Fox, S., 2003. Resources and Opportunities for Geoscience Faculty, MERLOT International 2003 Conference. Manduca, C.A., and Mogk, D.W., 2003. Using Science to Teach Science: Motivations, Methods and Tools, Geological Society of America Abstracts with Programs, Vol. 35, no. 6, pp. 115. Manduca, C.A., and Mogk, D.W., 2003. Using Data in Undergraduate Science Classrooms (PowerPoint 576kB Nov7 05), 2003 NSDL Annual Meeting (Washington D.C). Manduca, C.A., Mogk, D.W., and Stillings, N., 2003. Developing Collaborations Between Learning Scientists and Geoscience Educators, Fourth International Geoscience Education Conference (Calgary, Alberta, Canada). Mogk, D.W., Davidson, C., Manduca, C.A., and Brady, J., 2003. Teaching Petrology in the 21st Century: A Workshop Report and Call to Action, Eos Trans. AGU, Vol. 84, no. 46, Fall Meet. Suppl., Abstract ED51A-01. Manduca, C.A., 2002. Teaching Quantitative Skills in the Geosciences, DLESE Annual Meeting (Ithaca, NY). Manduca, C.A., 2002. Using Data in the Classroom Skills Workshop, Plenary Session at DLESE Annual Meeting (Ithaca, NY). Manduca, C.A., 2002. Digital Libraries: Helping Geoscientists Think about Issues in Teaching, Geological Society of America Abstracts with Program. Manduca, C.A., and Barstow, D., 2002. Creating State-based Alliances to Support Earth and Space Science Reform, Eos Trans. AGU, Vol. 83, no. 19, pp. 119. Manduca, C.A., and Fox, S., 2002. Supporting Professional Development for the Earth System Community (Acrobat (PDF) 1MB Nov8 05), 2002 DLESE Annual Meeting (Ithaca, NY). Manduca, C.A., Fox, S., and Mogk, D., Oct. 2002. Using Data in the Classroom: Combining Collection and Services in a Specialized Portal for Educators and Developers, NSDL All Projects Meeting Abstracts. Manduca, C.A., Fox, S., Savina, M., and Merritts, D., Oct. 2002. Our Next Project: Linking Pedagogy, Resources and Community Interaction to Support Entry-Level Undergraduate Geoscience Education, NSDL All Projects Meeting Abstracts. Manduca, C.A., and Mogk, D.W., 2002. A Role for Digital Libraries in Facilitating K-16. Geological Society of America Abstracts with Program. Manduca, C.A., and Mogk, D.W., 2002. Engaging Students with Data in Geosciences Courses: Why, How, and to What Effect?, Eos Trans. AGU, Vol. 81, no. 19, Abstract ED22A-02. Manduca, C.A., and Weingraff, M., 2001. Creating an Integrated Community-Wide Effort to Enhance Diversity in the Geosciences, Eos Trans. AGU, Vol. 82, no. 20, pp. 113. Mogk, D.W., and Manduca, C.A., 2001. New Dimensions of Discovery About Earth and Space Science Using the Digital Library for Earth System Education (DLESE), Eos Trans. AGU, Vol. 82, no. 47, pp. 231. Copyright American Geophysical Union, 2008. Digital Libraries: What Can They Do For You?